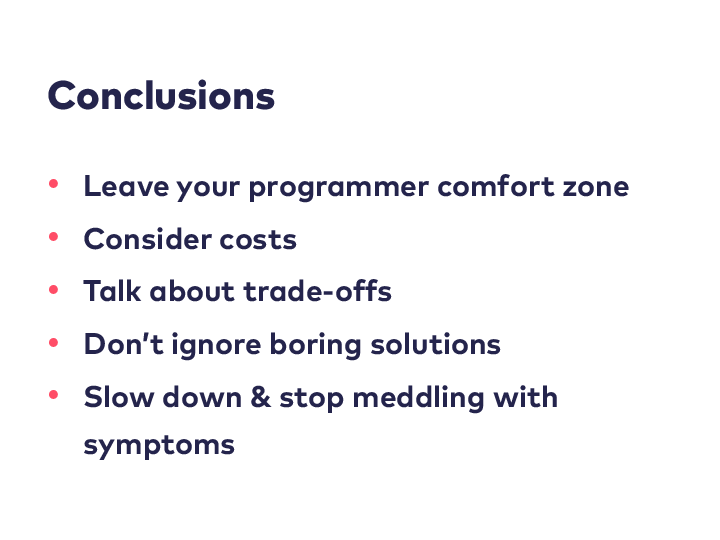 This blog post is a text version of a talk I gave at Lambda World Cádiz on October 25, 2018, for those who couldn’t attend and don’t like watching video recordings. Thanks a lot to Jan Stępień for encouraging me to publish a text version of my talk. In this article, I want to share my thoughts on a trend I have been observing for a few years. It’s a trend that probably exists in the strongly typed functional programming community at large, and to some extent, it’s possibly just a specific shape of a general trend in the realm of software development. But I have mainly observed it in the Scala community, because that’s where I spend most of my time. I want to talk about how we often cause more complexity than necessary with the methods we choose. In fact, it seems to me as if we sometimes cherish complexity instead of fighting it. So let’s see why that’s the case and what we could do about it. While this blog post is based on my experience in the Scala community, you don’t have to be fluent with Scala in order to take something away from it. Before we can have a conversation about what’s wrong with our relationship to complexity, though, it’s necessary to talk about what complexity actually is. After that, I will go into more detail about the phenomemon I call the complexity trap. When we say that something is “complex”, what it means, according to the dictionary, is that it’s “hard to separate, analyze, or solve”. The word originates from the Latin verb “complectere”, which means “to braid”. Consider a bunch of modules that are completely entangled — so much so that you can neither reason about them individually any more nor change one of them without touching the other as well. That’s a pretty good example of complexity in software development. But it also helps to look at the origin of the word “simple” — the opposite of “complex”. “Simple” has its roots in the Latin adjective “simplex”, which means “single” or “having one ingredient”. In software development, we have a few principles that aim to achieve simplicity in this original sense. 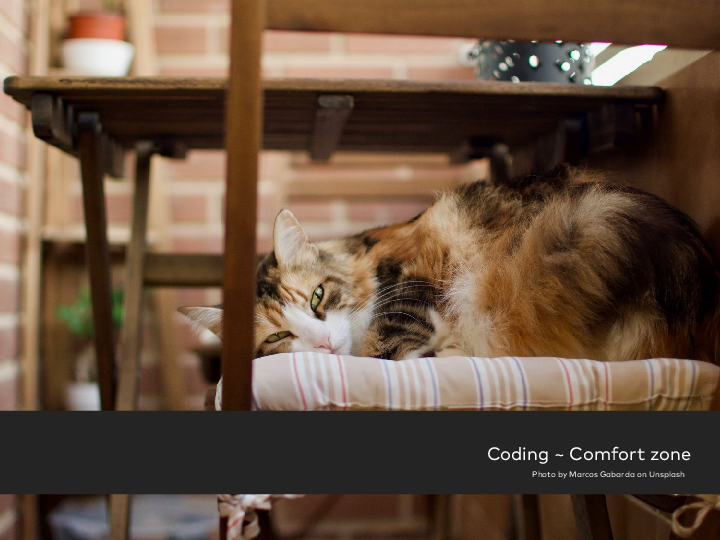 Two prominent examples of that are The Single Responsibility Principle and Separation of Concerns. On such separation of concerns that we really love to enforce as functional programmers is the separation between effects and business logic. If these two concerns are not separated, it makes our code harder to reason about and more difficult to test. Hence, we try to isolate business logic from effects and implement the former as pure functions. In his classic paper “No Silver Bullet”, Fred Brooks identified two different types of complexity. Essential complexity is inherent in the problem domain. We cannot remove it because it stems from the very problem that we are supposed to solve with our software. Accidental complexity, on the other hand, is of our own making. This is complexity that is created by software developers, and in principle, it’s possible to remove complexity of this type. 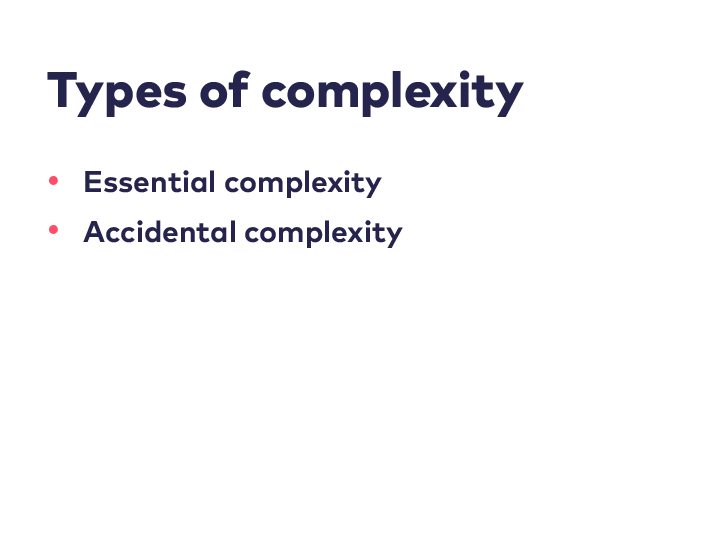 According to Brooks, we spend most of our time tacking essential complexity these days, and there is not much accidental complexity left. This means that reducing accidental complexity further will not yield a lot of benefit. But that statement is from 1986. Today, it’s 2018, and I beg to disagree. I think we are spending a crazy amount of time managing accidental complexity, and we should put our focus much more on minimizing it. Over time, various metrics for complexity have been created, especially, but not exclusively, for code complexity. The most well-known of those metrics is probably McCabe’s cyclomatic complexity: The more different code paths there are in a function, the higher its complexity. So one of the things that increased a function’s complexity is branching, for example by means of if expressions of pattern matching expressions. The higher the cyclomatic complexity of a function, the more test cases are necessary to achieve full path coverage. Of course, there are other relevant metrics related to complexity in software development. Complexity can be measured at different levels, not only at the code level. For example, we can measure the extent of coupling between modules. The more dependencies there are between the modules of a system, the higher its overall complexity. 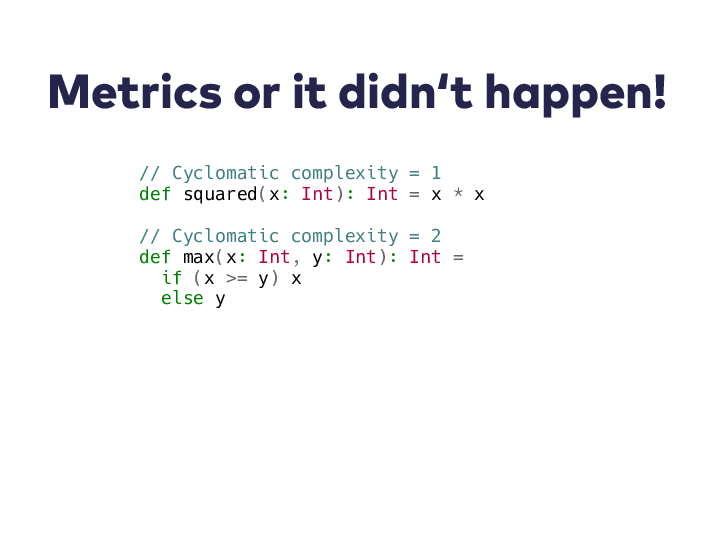 But let’s come back to cyclomatic complexity. It’s certainly okay as a metric of how hard it is to test a function. However, I am actually more interested in how difficult it is to reason about what a function or a program is doing — or to reason about a system or an entire system of systems. In other words, I am interested in cognitive complexity. In the imperative version of the sumOfPrimes function, a lot of complexity stems from mutable state and flow control statements. The functional solution doesn’t have any of that. So you could say that we are a bit at an advantage as functional programmers. However, we shouldn’t be too smug about it either. 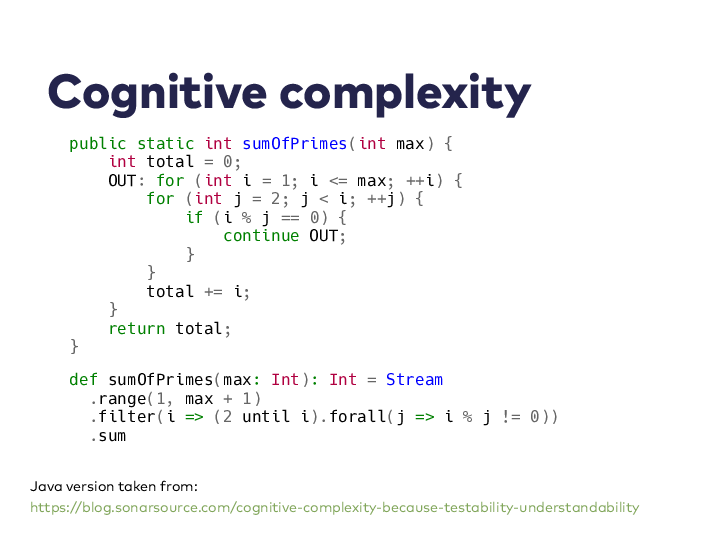 What I find interesting is that Sonarsource actually created a metric for the cognitive complexity of code. However, I think that not every aspect of what constitutes cognitive complexity can easily be captured in metrics. For example, syntax, boilerplate, indirections can all add to a program’s cognitive complexity as well. But why is it so important to keep complexity in check anyway? 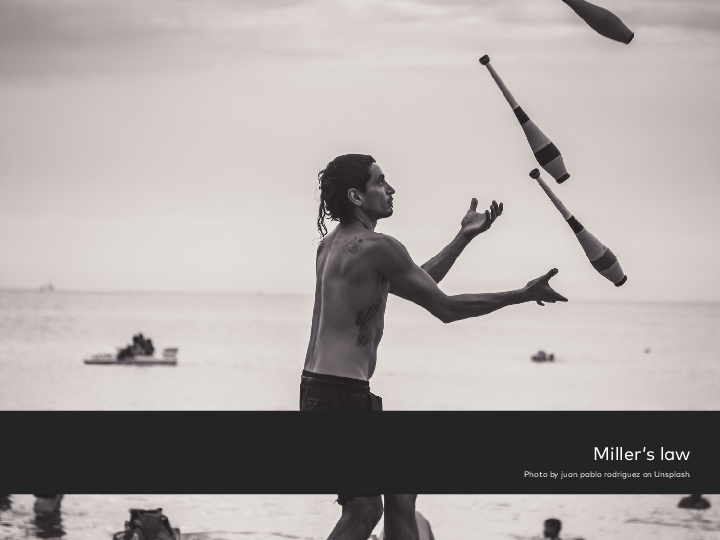 Sadly, we human beings are incredibly bad at juggling with many things at once. According to a classic study by George Miller, a cognitive psychologist, human beings can only hold seven items in working memory at the same time, plus or minus two, on average. So the more concerns are entangled, the more code paths there are, and the more syntax and boilerplate there is, the more difficult it will be for us to reason about a program. In order to mitigate this, we use abstractions. Ideally, our programs are composed of many small functions, and we put related functions into the same module. In order to reduce coupling and the complexity of the whole system, we hide implementation details of our modules from others that depend on them. In functional programming, we take abstraction much further than in other paradigms. We often abstract over things like iteration or data types in a way that is rarely seen outside of functional programming. This faciliates the definition of very simple functions that can be composed in many different ways — which is exactly what allowed us to write our sumOfPrimes function in a way that is much easier to reason about than the imperative version. 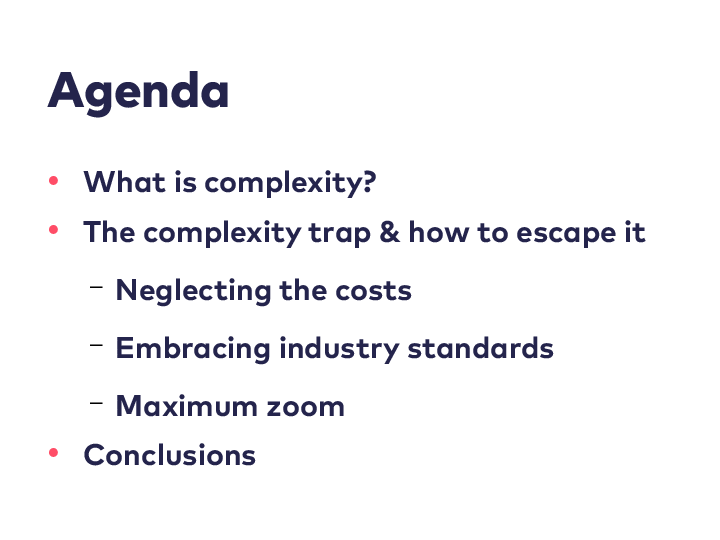 Now that we have achieved a common understanding of what I mean when I talk about complexity, let me introduce you to my notion of the complexity trap. 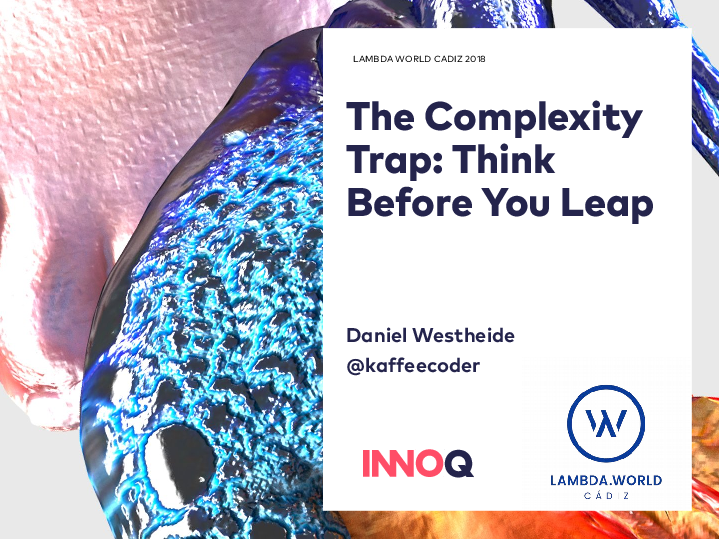 It might be fair to say that there is not a single complexity trap but rather multiple traps, even though they are all related to each other in one way or another. The first trap that I want to talk about is neglecting the costs. We often seem to ignore the costs of the approaches and technique we choose to implement our programs. Usually, the intentions are good: Often, we choose a technique because we explicitly want to reduce the complexity in our code base. But sometimes, doing so comes with a cost — and that cost can even be new complexity at a different level, which might be worst than what we had before. Let me illustrate this with an example. 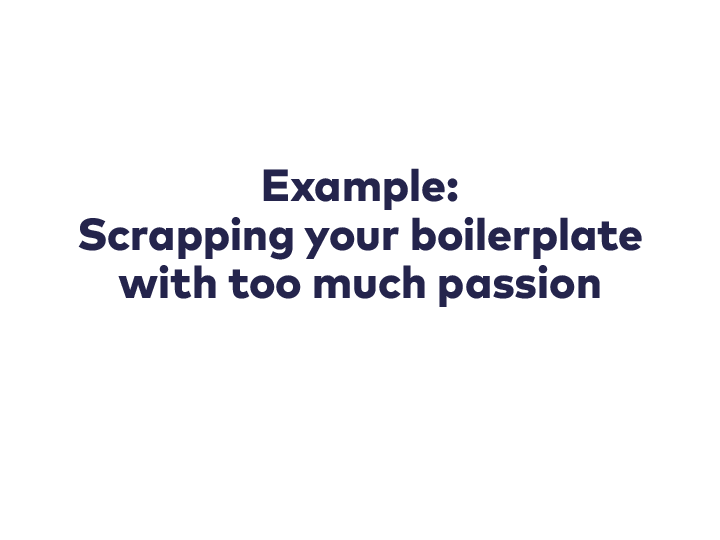 In general, scrap your boilerplate is a very desirable principle, because the more boilerplate code we have to write, the higher the complexity of our program and the higher the chance that we introduce bugs that could easily be avoided. There is one specific way of scrapping boilerplate that is as popular in the Scala community as it is problematic. In Scala, the way that you encode values of a certain type to JSON and back is often defined via typeclasses. Instances of these typeclasses can often be derived automatically for arbitrary data and record types with a single line of code. This feature is heavily used in many Scala projects. However, people rarely seem to consider the cost-value ratio of the way they use these automatically derived JSON codecs: In almost all projects I have seen, people use automatically derived JSON codecs to expose their internal domain model to the outside world. Doing that certainly means that you scrap quite a bit of boilerplate and reduce the complexity in your code. However, if you look at the bigger picture, this is the opposite of removing complexity. Exposing your domain model like this almost always leads to strongly coupled systems that are very difficult to evolve. If you ask me, this is one of the most promising ways to create a distributed monolith. It really amazes me how many people are totally okay with simply making their internal model their public API, especially since functional programmers are usually crazy about abstractions. Apparently, we are even crazier about removing boilerplate. However, there are alternatives. If you don’t want to expose your domain model, but you want to avoid having to define your JSON codecs manually, another way to decouple your model and your API is to introduce a DTO layer. This is an abstraction layer that is often ridiculed these days While it would allow you to use automatically derived JSON codecs for your separate DTO type hierarchy, it would still be necessary to implement a mapping between your domain model and your DTOs. You will probably end up with as much boilerplate code as if you had manually defined your JSON codecs for your domain model types. In the end, you have to choose your poison. Simply exposing your domain model with automatically derived JSON codecs is probably the most addictive poison, because it gives you instant gratification. In the long run, however, you will almost certainly have to pay the price. You know what’s industry standard? 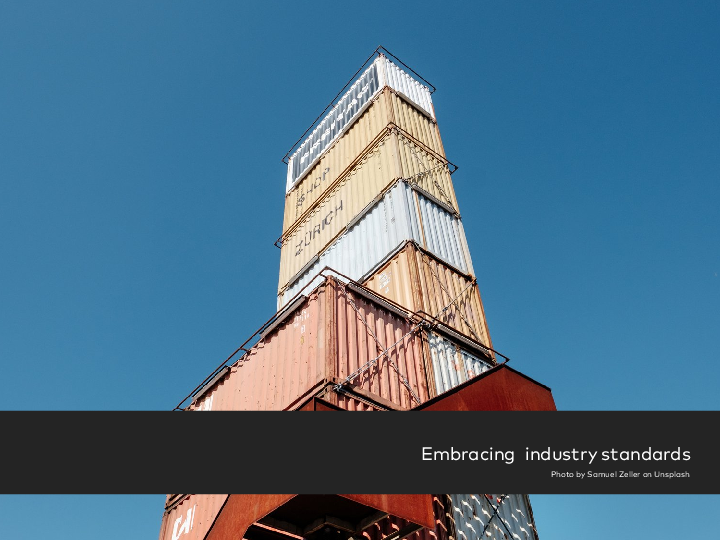 Shipping containers! 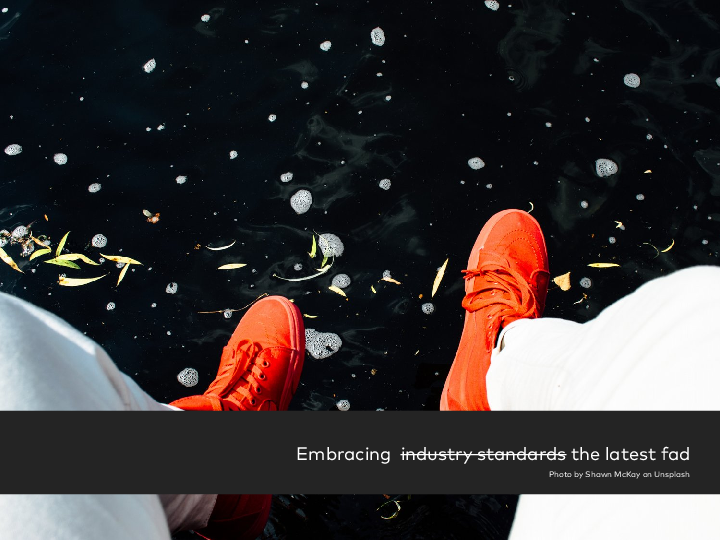 However, when people say “industry standard”, what they actually refer to is often just the latest fad — something that will definitely not be industry standard any more in a couple of years. If we follow this approach, it means that we adopt techniques without thinking. We don’t think about their costs, and we certainly don’t think about whether the benefits of that technique can even be realized in our specific situation. Here is a prime example that pops up in many Scala projects: Many people seem to think that they will be excommunicated from the Church of Functional Programming if they don’t use free monads or tagless final. There is this mantra that you must not commit to a specific effect monad too early. So what is a Scala developer going to do? Well, one thing is for sure: They are not going to commit to anything. 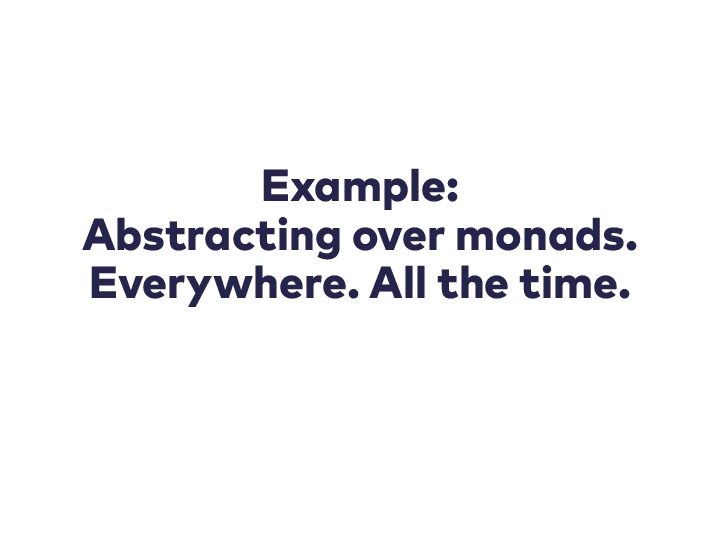 Instead, they are going to abstract over monads and over many other things — everywhere and all the time. There are good reasons why you want to abstract over the effect monad when you develop a library. For example, when you provide an HTTP client library, you want to enable people to use it regardless of which effect monad they prefer. Also, if you really have the need to interpret some instructions in different ways in your application, free monads or tagless final are a perfectly reasonable choice. For example, you may want to define a data processing pipeline that and then be able to execute it either in a Hadoop cluster or on a single machine. However, most of the time when we write applications, such a need doesn’t exist. So what other reasons to abstract over the effect monad are there? Well, preparing for the ability to switch from Monix Task to ZIO is a bit like staying away from Postgres-specific SQL because you might switch to MySQL one day. So the main reason that remains for people to abstract over the effect type in application development is the desire to make their effectful code unit-testable. How does this work? You have a function that mixes logic as well as effects, and in your production code, you execute it in your favourite effect monad, talking to a real external system. In unit tests, on the other hand, you execute it in the Id monad, using hard-coded test data. Object-oriented programmers call this technique stubbing, and they get mocked for doing it, mostly by people like us. 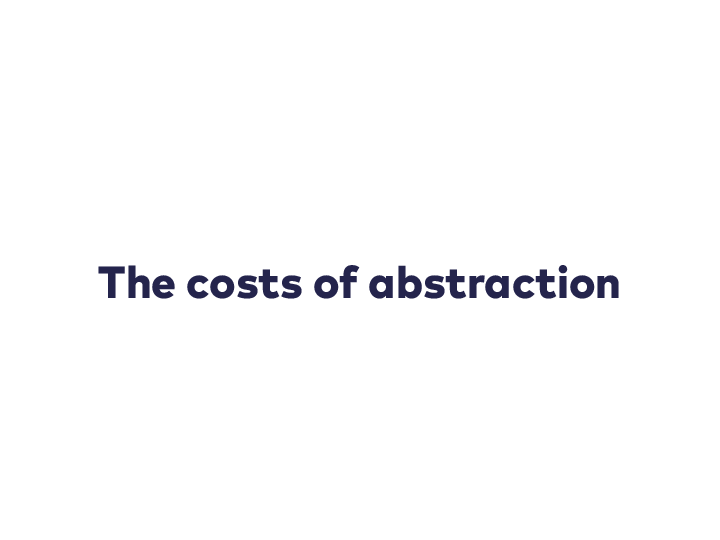 It’s important to understand and keep in mind that abstracting over effect monads comes with a cost. For one, there is quite a bit of boilerplate code involved. Some of that is just syntactic noise that is due to the fact that Scala’s type inference is quite limited. But there is also the whole interpreter for your algebra, which I’m not even showing. And if your program has some conditional logic, things can get rather messy pretty quickly. Also, by their very definition, monads are strictly sequential. If you want to execute some effects in parallel, because they are actually independent from one another, you will have to abstract over applicatives as well. Getting those to actually execute in parallel in your target effect tyoe, however, is surprisingly easy to get wrong in my experience. Finally, abstracting over effect monads seems to lead people to writing big functions in which logic and effects are completely entangled, because they are still abel to unit test the whole big function using the Id monad. There is an alternative that seems to be almost taboo, which is to not abstract over your effect monad at all in your application code. If you’re honest, when testing with the Id monad, you’re only testing the few pieces of application logic within your big effectful function and you’re verifying that your test interpreter is working as expected. But you have no clue if your production interpreter, which is talking to an external system, is working correctly at all. So abstracting over the effect monad and using the Id monad in tests doesn’t even help you to write meaningful tests. If you forego this abstraction, you will be able to use your effect type in all its glory. Among other things, this makes stuff like parallel execution very straightforward. If you follow this approach, you have to be very strict about separating the logic of your program from the parts involving IO or other effects. One way of doing this is to employ a Functional Core, Imperative Shell architecture. 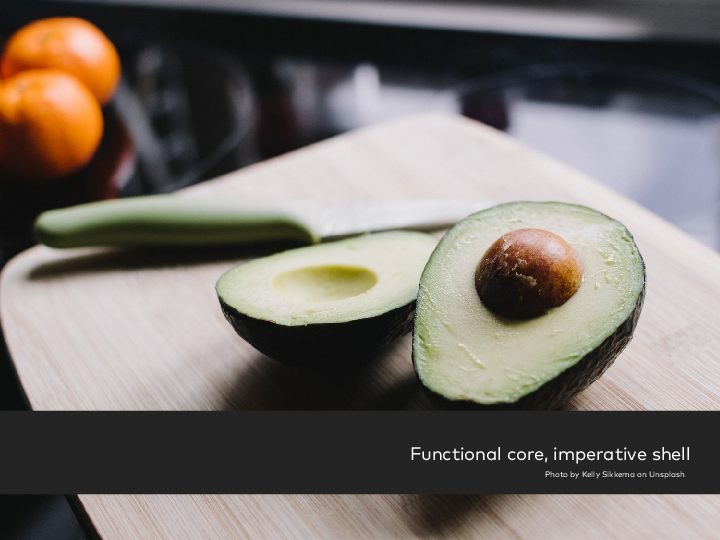 What this means is that you’ll move all the logic into the purely functional core. If necessary, you will have to extract it from your big effectful functions. This way, you can minimize the branching happening in the imperative shell and, since you can use the whole functionality of your favourite effect type there. With all the logic being implemented in rather small, pure, and effect-free functions, it becomes a lot easier to write unit tests for your application’s logic. The imperative shell will be almost free of logic, so that it can be covered with only a small number of integration tests. This does a better job at testing what is happening in a production-like environment. Free monads or tagless final are not a great choice if you only care about testability. There are alternatives that are less complex and at least as adequate for achieveing this goal. So why is it that people jump to certain solutions so quickly? I have the impression that the discourse in our community is characterized by a focus on how to use certain abstractions. At best, we find discussions of when to use one abstraction over another. But we rarely see discussions about when not using any of those abstractions might be a viable solution. I think we should all talk and write more about the costs of certain abstractions and have critical discussions of the trade-offs we need to make. Abstractions are supposed to help us keep complexity in check, but using them can come with its own complexity as well. Usually, a given abstraction is a very good fit for a few particular use cases. However, there are often alternative solutions that are more adequate for other use cases. These solutions are often both less complex and more boring. 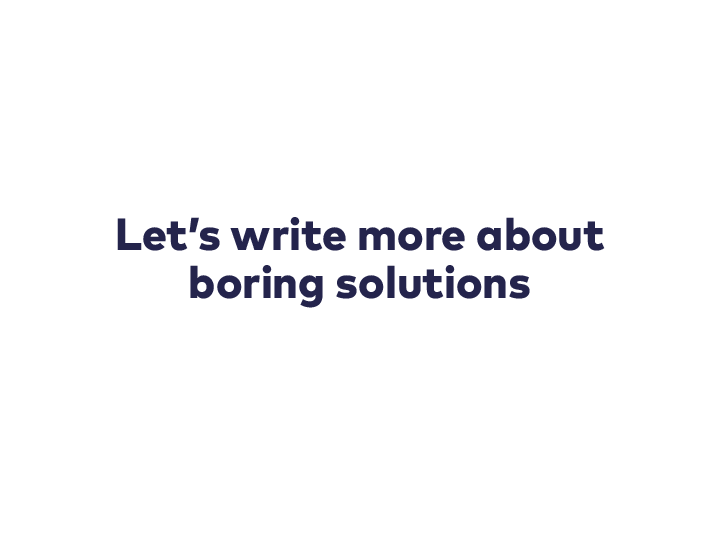 Unfortunately, we don’t like boring. We like to take the language and the compiler to their limits. We also like to adopt the latest fad. But the software systems we work on in our jobs should not be a playground or a test bed for the latest fad. So let’s talk and write more about when certain abstractions are a good fit and when they are not, and about when a more boring solution might be a better fit. And when someone in your team tells you, “This problem must be solved with free monads”, don’t be afraid to ask why. In general, make a habit of demanding to hear why and approach was chosen, which alternatives have been considered, and why they’ve been discarded. 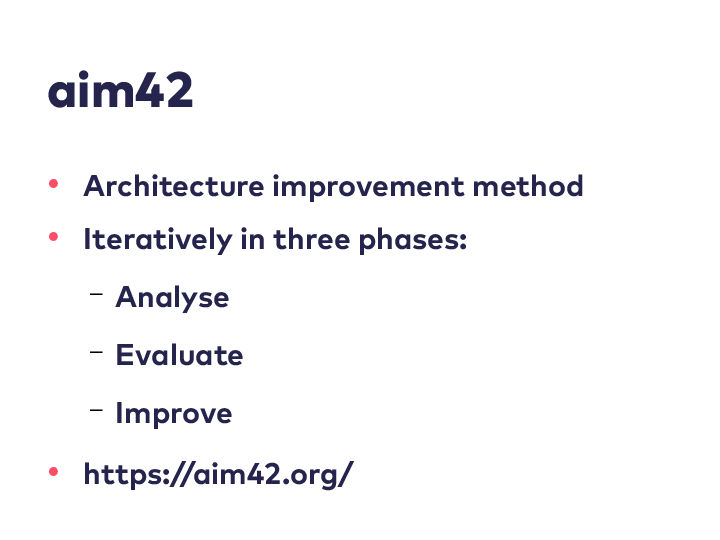 A great technique for documenting these decisions for future reference is to write Architecture Decision Records (ADR). 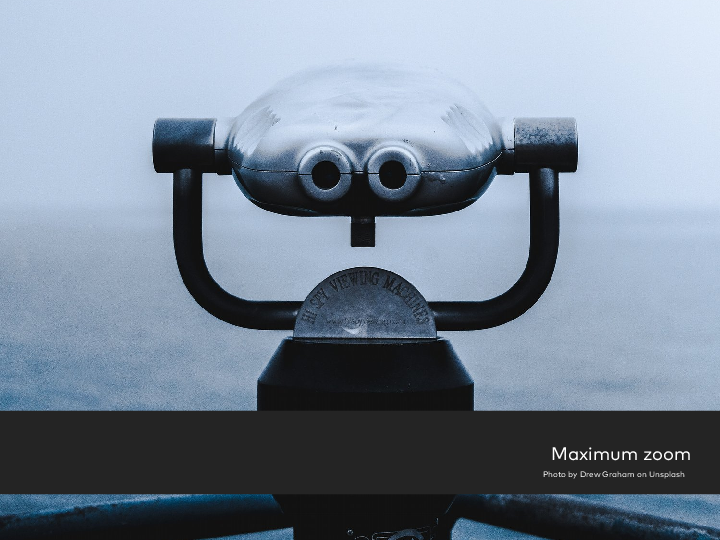 The last aspect of the complexity trap that I want to discuss is what I call maximum zoom. Have you ever used one of those coin-operated telescopes, or binoculars, in order to zoom in to some detail of a scenic view? Maybe you have also experienced how easy it is to lose your bearings and how difficult it can be to keep track of the broader context. I think the same thing happens a lot in software engineering. Let me explain this with an example. These days, many teams face the challenge that the system they are working on needs to make a lot of requests to various other systems. Very often, this happens in a Netflix-style microservice architecture, where you have tons of tiny microservices and another service in front of those, orchestrating the others, aggregating their response data and doing some additional processing, for example filtering. One particular pattern in which such an orchestration service occurs is BFF (backend for frontend). 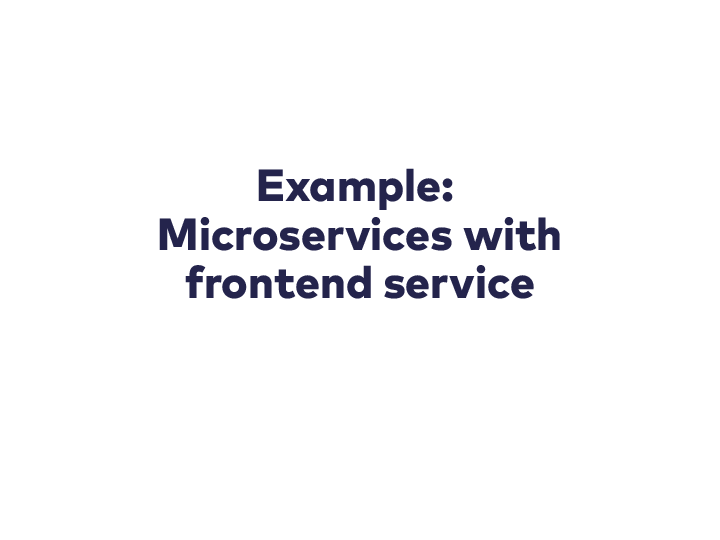 Very often, having to make all these requests to multiple backend microservices leads to high response times for the end user, which is then mitigated by introducing batching and caching of previous results, and also by making requests that are independent from one another in parallel. Imagine we’d be taking care of all these different concerns in the same place. That would certainly not be simple, as in “having one ingredient” — which is exactly why there are libraries that provide abstractions over these concerns, for example Stitch, Clump, or Fetch. Keep in mind that I don’t know anything about the context in which these libraries were created. For all I know, following that approach may have been the only viable solution to the problem the developers were facing in their specific situation, after careful analysis. Nevertheless, in my experience from other projects, the motivation to build abstractions like these is often to solve problems of a Netflix-style microservice architecture as the one I outlined above. As such, it serves as a nice example of the phenomenon that we often implement technological solutions to problems prematurely. I think that the reason why we see this phenomenon is that we don’t apply systematic approaches at improving our software systems often enough. 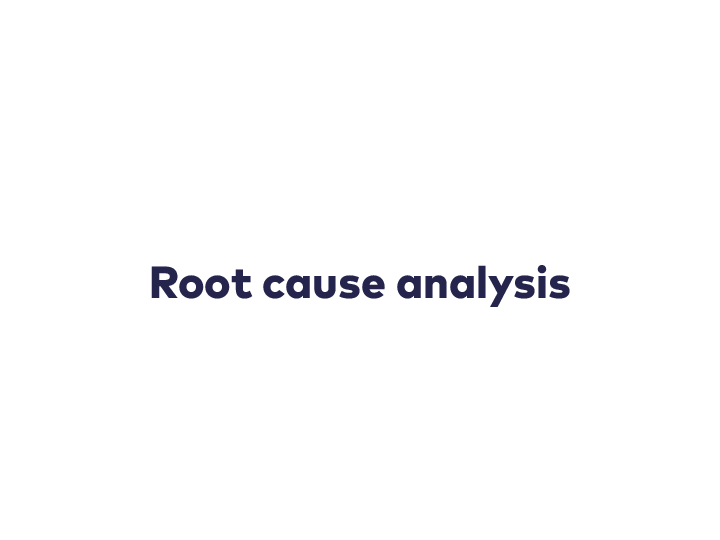 One of the most important techniques in the analysis phase is root cause analysis. Unfortunately, it’s also a tremendously underused technique. In my experience, people often jump to solutions too quickly. When we face a problem, we tend to immediately search for a solution for exactly this problem. Root cause analysis differentiates between problem and cause. The idea is to trace a problem to its origin and to identify root causes of symptoms or problems. When doing a root cause analysis, you continue to ask why until you have found the root cause in the causal chain. Let’s apply this to our high latency problem from our example. 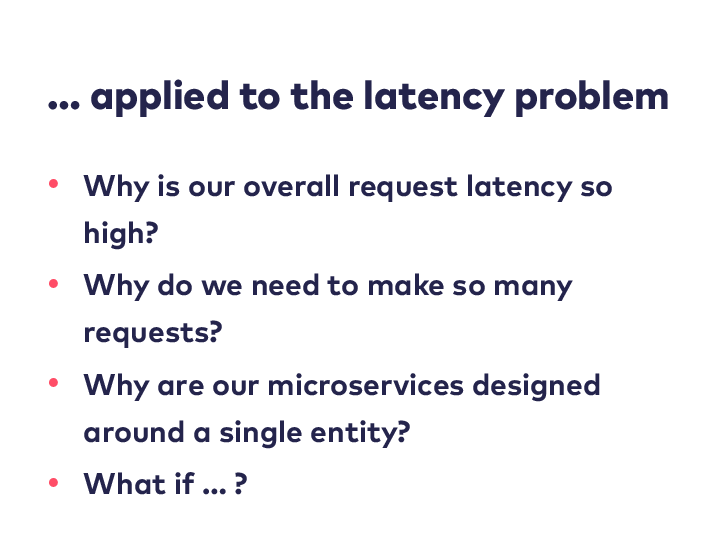 We could ask ourselves why our latency is so high and get to the answer that it’s because of all the requests we need to make in our BFF. But why do we need to make so many requests? The answer could be that it’s because we need to fetch data from many different services. And why do we need to do that? Maybe it’s because all our services are designed around a single entity. And why is that? At some point, we realize that we have an architectural problem at the macro level. Maybe, if we continue to ask why long enough, we will come to the conclusion that all these services we need to communicate with exist in exactly this way because of how the company is organized. In any case, high latency of our BFF is only a symptom, and the root cause, the thing we should try to solve, lies a lot deeper. By making the symptom less painful, we don’t reduce complexity in the system as a whole. Think of all the complexity that could be eliminated if we changed our architecture at the macro level — for example, if instead of a service in front of all those tiny microservices, we had a few slightly bigger systems that are not just built around a single entity or aggregate, but a whole Bounded Context. The whole orchestration and aggregation layer would be gone, and browsers would talk to those bigger systems directly, because they are entirely self-contained, including their own UI. 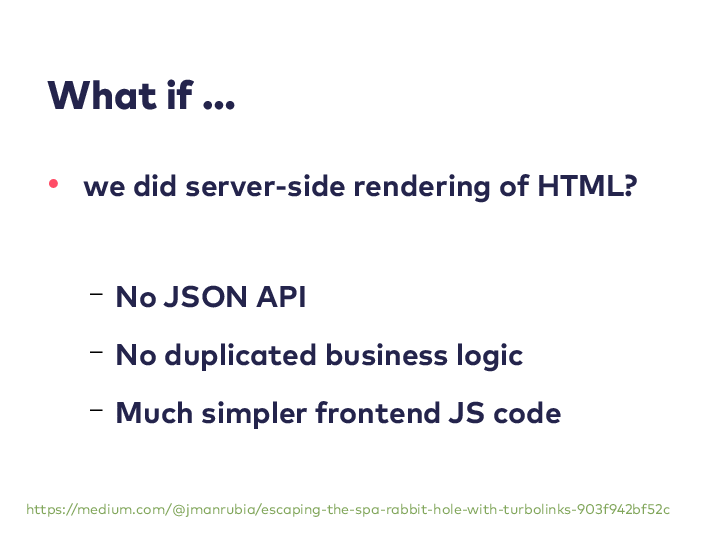 But the maximum zoop trap also applies to our issue with the JSON codecs. 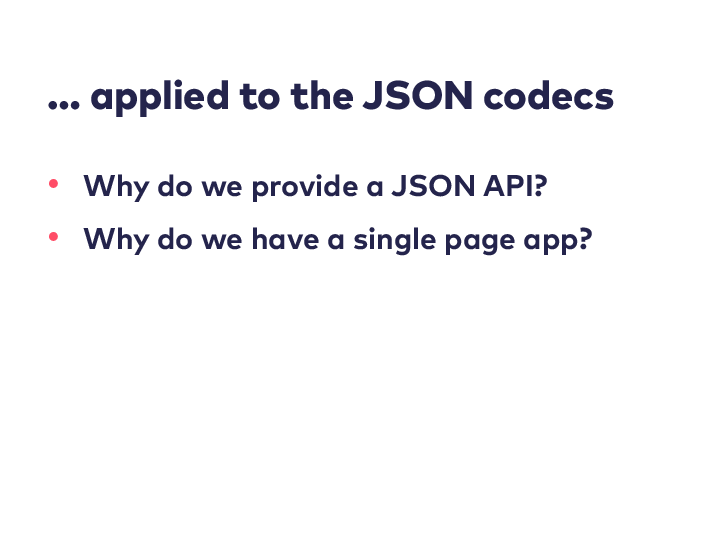 If we do a root cause analysis here, at some point, we may ask ourselves why we have a JSON API in the first place. Often, the sole consumer of such an API is a single page application (SPA) running in the browser. While there are perfectly valid use cases for SPAs, they are often chosen merely because it’s “industry standard” to use them these days — which brings us back to the trap of embracing industry standards. Moreover, we are programmers, and we like to write code. Having to build an SPA allows us to write even more code. It’s a new playground for doing functional programming — applicative functors in the browser, how amazing is that? In the words of Jorge Manrubia, who wrote a great article about how the complexity introduced by single-page applications can often be entirely avoided: “[..] what about if, instead of trying to find a solution, you put yourself in a situation where those problems don’t exist?” Eliminating problems altogether is always better than writing code to solve them, regardless of how purely functional that could is. But why is it that we fall for technological solutions so often, especially ones that don’t reduce complexity at all? I think that maybe we love progrmaming too much. I was recently talking to someone about Rust, and that person said, “A language without higher-kinded types is completely useless!”. Yes, certain abstractions are not possible without them, but I have never seen a project fail due to a lack of higher-kinded types. Projects fail because the problem domain is not well understood, or because the architecture is not a good fit for the requirements. They also fail because of how the organisation is structured and because of politics, be it intra- or inter-organizational. Projects fail because of people, and because of people not talking to each other. When we jump towards technological solutions, we often do this because we love programming. 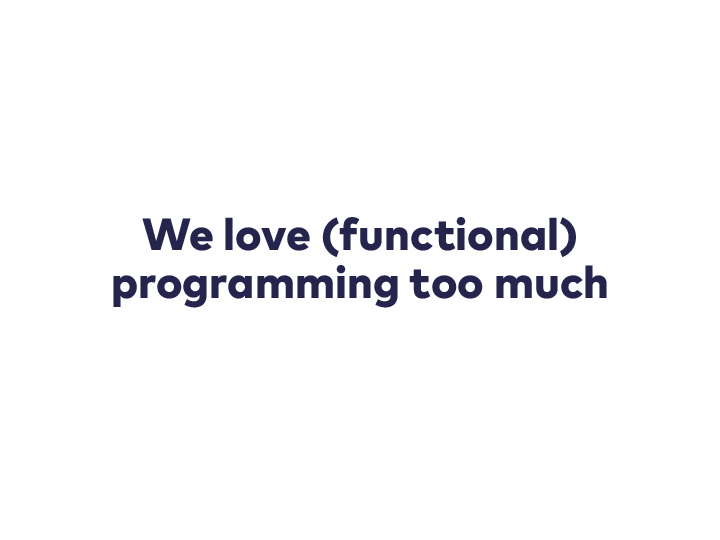 In our case, we love functional programming. We also love technological challenges. Solving a problem by writing code is our comfort zone, so we take this route even if the actual problem is not a technological one. We prefer to work around non-technical problems using technological solutions because that’s what we know, and it’s the more interesting way out. I work at a consultancy, and we are often hired to solve challenging technological problems. Often, it turns out that people only think that their challenges are about technology, but the important problems are not technological at all. I believe that as developers, our job is to solve problems and create value for the business and the users of the product we build. Our job is not to write code. Sometimes, doing our job means that we have to search for the root cause of a problem. Instead of solving a symptom by writing code, we have to tackle communication problems, deal with organizational issues, or improve the architecture of our system at the macro level. I think that jumping towards technological solutions for symptoms also happens because everything that is not solvable with code is often seen as a given, something you can’t change anyway. I think it’s worth giving it a try more often, whether you are a consultant or not. Things are not always set in stone. 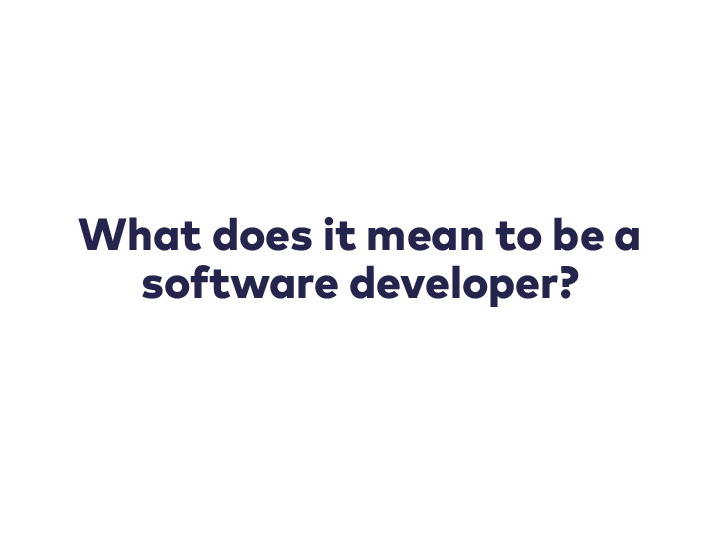 And if we are serious about reducing accidental complexity, we should question our self-concept, our idea of what it means to be a software developer. To summarize, we have to deal with a lot of accidental complexity these days, for multiple reasons. First of all, we adopt techniques and abstractions without analyzing and evaluating their costs and their usefulness in our specific situation. 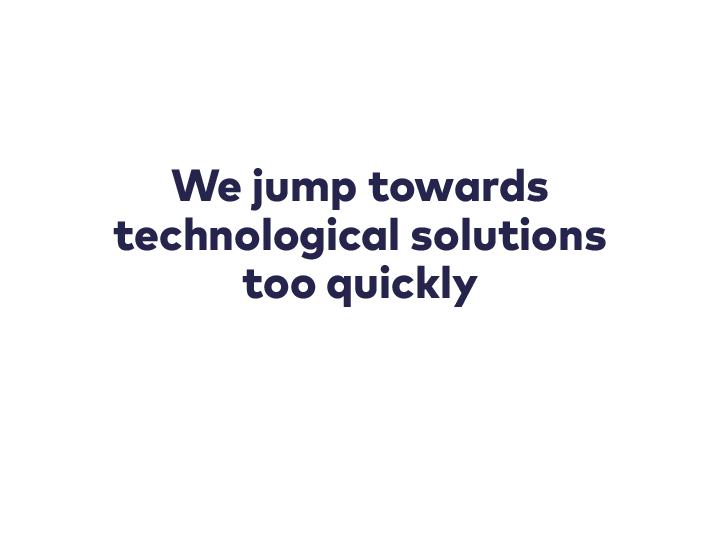 Moreover, we love solving technological problems. So let’s shift our discourse and talk more about when certain abstractions are a good fit and when they aren’t, and let’s bring more boring but possibly simpler solutions to the table. Also, don’t be afraid to demand explanations for architectural decisions. Finally, let’s slow down when facing a problem. Let’s take the time to analyze its root cause and let’s jump out of our comfort zone, if necessary — even if it means that we will eliminate the problem and rob ourselved of a chance to solve it. For the past 15 months, I have been working on a new library on and off. So far, I have been mostly silent about it, because I didn’t feel like it was ready for a wider audience to use – even though we had been using it successfully in production for a while. However, since I broke my silence as long ago as April this year, when I did a talk about it at this year’s ScalarConf in Warsaw, a blog post is overdue in which I explain what this library does and why I set out to write it in the first place. Last year, I was involved in a project that required my team to implement a few Spark applications. For most of them, the business logic was rather complex, so we tried to implement this business logic in a test-driven way, using property-driven tests. At first glance, it looks like this is a great match. When it comes down to it, a Spark application consists of IO stages (reading from and writing to data sources) and transformations of data sets. The latter constitute our business logic and are relatively easy to separate from the IO parts. They are mostly built from pure functions. Functions like these are usually a perfect fit for test-driven development as well as for property-based testing. However, all was not great. It may be old news to you if you have been working with Apache Spark for a while, but it turns out that writing real unit tests is not actually supported that well by Spark, and as a result, it can be quite painful. The thing is that in order to create an RDD, we always need a SparkContext, and the most light-weight mechanism for getting one is to create a local SparkContext. Creating a local SparkContext means that we start up a server, which takes a few seconds, and testing our properties with lots of different generated input data takes a really long time. Most certainly, we are losing the fast feedback loop we are used to from developing web applications, for example. Now, we could confine ourselves to only unit-testing the functions that we pass to RDD operators, so that our unit tests do not have any dependency on Spark and can be verified as quickly as we are used to. However, this leaves quite a lot of business logic uncovered. Instead, at a Scala hackathon last May, I started to experiment with the idea of abstracting over Spark’s RDD, and kontextfrei was born. The idea is the following: By abstracting over RDD, we can write business logic that has no dependency on the RDD type. This means that we can also write test properties that are Spark-agnostic. Any Spark-agnostic code like this can either be executed on an RDD (which you would do in your actual Spark application and in your integration tests), or on a local and fast Scala collection (which is really great for unit tests that you continously run locally during development). resolvers += "dwestheide" at "https://dl.bintray.com/dwestheide/maven"
libraryDependencies += "com.danielwestheide" %% "kontextfrei-core-spark-2.2.0" % "0.6.0"
libraryDependencies += "com.danielwestheide" %% "kontextfrei-scalatest-spark-2.2.0" % "0.6.0" % "test,it"
Please note that in this simple example, we create a Spark application that you can execute in a self-contained way. In the real world, you would add spark-core as a provided dependency and create an assembly JAR that you pass to spark-submit. case (word, count) => s"$word,$count"
The first thing you’ll notice is that the implementations of counts and formatted look exactly the same as they would if you were programming against Spark’s RDD type. You could literally copy and paste RDD-based code into a program written with kontextfrei. The second thing you notice is that the method signatures of counts and formatted contain a type constructor, declared as F[_], which is constrained by a context bound: For any concrete type constructor we pass in here, there must be an instance of kontextfrei’s DCollectionOps typeclass. In our business logic, we do not care what concrete type constructor is used for F, as long as the operations defined in DCollectionOps are supported for it. This way, we are liberating our business logic from any dependency on Spark, and specifically on the annoying SparkContext. In order to be able to use the familiar syntax we know from the RDD type, we mix in kontextfrei’s SyntaxSupport trait, but you could just as well use an import instead, if that’s more to your liking. Our Main object mixes in our WordCount trait as well as kontextfrei’s RDDOpsSupport, which proves to the compiler that we have an instance of the DCollectionOps typeclass for the RDD type constructor. In order to prove this, we also need an implicit SparkContext. Again, instead of mixing in this trait, we can also use an import. 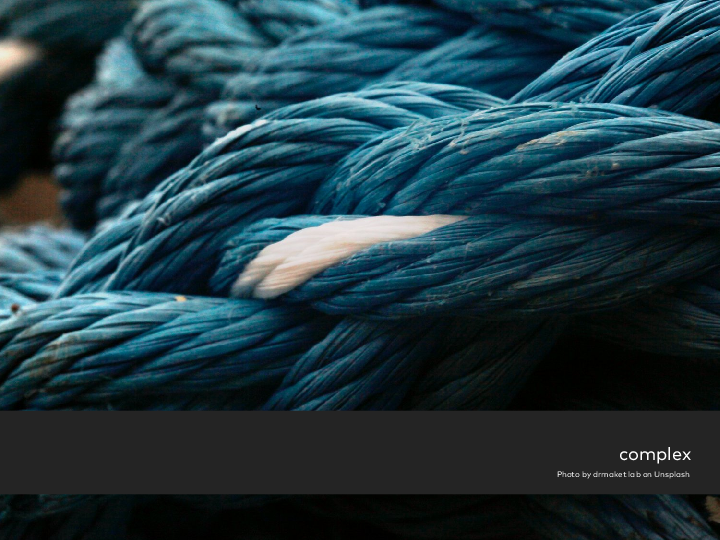 Now, our Main object is all about doing some IO and integrating our business logi into it. BaseSpec, like our WordCount trait, takes a type constructor, which it simply passes along to the KontextfreiSpec trait. We will get back to that one in a minute. We mix in BaseSpec and pass it the Stream type constructor. Stream has the same shape as RDD, but it is a Scala collection. The KontextfreiSpec trait extended by BaseSpec defines an abstract implicit DCollectionOps for its type constructor. By mixing in StreamSpec, we get an instance of DCollectionOps for Stream. When we implement our business logic, we can run the WordCountSpec test and get instantaneous feedback. We can use SBT’s triggered execution and have it run our unit tests upon every detected source change, using ~test, and it will be really fast. This time, we mix in RDDSpec because we pass parameterize BaseSpec with the RDD type constructor. It was an explicit design goal to stick to the existing Spark API as closely as possible, allowing people with existing Spark code bases to switch to kontextfrei as smoothly as possible, or even to migrate parts of their application without too much hassle, with the benefit of now being able to cover their business logic with missing tests without the usual pain. An alternative to this, of course, would have been to build this library based on the ever popular interpreter pattern. To be honest, I wish Spark itself was using this pattern – other libraries like Apache Crunch have shown successfully that this can help tremendously with enabling developers to write tests for the business logic of their applications. If Spark was built on those very principles, there wouldn’t ne any reason for kontextfrei to exist at all. kontextfrei is still a young library, and while we have been using it in production in one project, I do not know of any other adopters. One if its limitations is that it doesn’t yet support all operations defined on the RDD type – but we are getting closer. In addition, I have yet to find a clever way to support broadcast variables and accumulators. And of course, who is using RDDs anyway in 2017? While I do think that there is still room for RDD-based Spark applications, I am aware that many people have long moved on to Datasets and to Spark Streaming. It would be nice to create a similar typeclass-based abstraction for datasets and for streaming applications, but I haven’t had the time to look deeper into what would be necessary to implement either of those. kontextfrei is a Scala library that aims to provide developers with a faster feedback loop when developing Apache Spark applications. 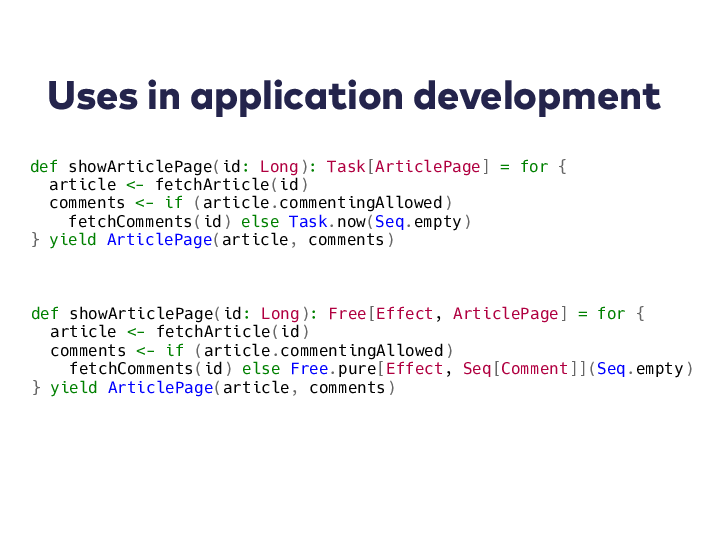 To achieve that, it enables you to write the business logic of your Spark application, as well as your test code, against an abstraction over Spark’s RDD. I would love to hear your thoughts on this approach. Do you think it’s worth it defining the biggest typeclass ever and reimplementing the RDD logic for Scala collections for test purposes? Please, if this looks interesting, do try it out. I am always interested in feedback and in contributions of all kind. In 1999, Andrew Hunt and Dave Thomas, in their seminal book, demanded that programmers be pragmatic. Ten years later, Chad Fowler, in his excellent book on career development, asked programmers to be passionate. Even today, I still consider a lot of the advice in both of these books to be incredibly valuable, especially Fowler’s book that helped me a lot, personally. Nevertheless, in recent years, I have witnessed again and again that one other quality in programmers is at least as important and that it hasn’t even seen a fraction of the attention it deserves. The programmer we should all strive to be is the empathic programmer. Of course, I am not the only one, let alone the first one, to realize that. For starters, in my bubble, Benjamin Reitzimmer wrote an excellent post about what he considers to be important qualities of a mature developer a while ago, and empathy is one of them. I consider a lack of empathy to be the root cause for some of the biggest problems in our industry and in the tech community. In this post, I want to share some observations on how a lack of empathy leads to problems. Consider it a call to strive for more empathy. It shouldn’t come as a surprise that the ability to show empathy can come in handy in any kind of job that involves working with other people, including the job as a programmer. This is true even if you work remotely – the other messages you see in your Slack channels are not all coming from bots. There are actual human beings behind them. One of the situations where we often forget to think about that is code reviews. Just writing down what is wrong with a pull request without thinking about tone can easily lead to the creator of the pull request feeling personally offended. April Wensel has some good advice on code reviews. What’s crucial is to develop some sensitivity for how your words will be perceived by the receiver, which requires to put yourself into their shoes, see through their eyes and reflect how they will feel. This is easier the better you know the person, otherwise you will have to make some assumptions, but I think that’s still far better than not reflecting at all on how the other person will feel. Another workplace situation where I have often seen a lack of empathy is when members of two different teams need to collaborate to solve a problem or get a feature done. In some companies, I have seen an odd, competitive “us versus them” attitude between teams. This phenomenon has been explored by social and evolutionary psychologists, and while such a behaviour might still be in our nature, that doesn’t mean that we cannot try to overcome it. A variant of “us versus them” is “developers versus managers”. We developers have a hard time understanding why managers do what they do, but frankly, often, we don’t try very hard. I have often seen developers taking on a very defensive stance against managers, and of course, the relationship between managers and developers in these cases was rather chilly. Getting to know “the other side” would certainly help to empathize with managers. Understanding why they act in a specific way is absolutely necessary in order to get to a healthy relationship with them. Empathy is not only important at your workplace, but also very much so when you are interacting with others in our community, be it on mailing lists, conferences, or when communicating with users of your open source library, or developers of an open source library you are using. In some of these situations, a lack of empathy can strengthen exclusion, ultimately leading to a closed community that is perceived as elitist and arrogant. As a developer using an open source library, empathize with the developers of the library before you start complaining about a bug, or better yet, a missing feature. Sam Halliday wrote an interesting post called The Open Source Entitlement Complex. It’s hard to believe, but apparently, many users of open source libraries have this attitude that the developers of these libraries are some kind of service provider, happily working for free to do exactly what you want. This is not how it works. The same way that wording and tone are important in code reviews, try to empathize with the developers who spend their free time on this library you use. Serving you and helping you out because you didn’t read the documentation is probably not their highest priority in life, so don’t treat them as if it is. On the other hand, when presenting your open source library to potential users, consider how these people will feel about that presentation. Does it make them feel respected? Does it make them feel welcome? I am sorry to disappoint you, but I think that a foo bar “for reasonable people” does not have that effect. Personally, I find this to be very condescending and think it will intimidate a lot of people and turn them away. It implies that any other way than yours is not reasonable, and that, hence, people who have not used your library yet, but some different approach, are unreasonable people. As library authors, let’s show some empathy as well towards our potential users. As always in tech, there is no silver bullet, and there are trade-offs. There are probably perfectly good reasons why someone has been using a different library so far, and maybe even after looking at your library, there will still be good reasons not to use yours. Even if you are convinced that your library is so much better, you aren’t exactly creating an open and welcoming atmosphere by basically telling people visiting your project page that they are unreasonable for using anything else. If you are at a tech conference, and you ask women whether they are developers at the very beginning of your conversation, but don’t do the same with men, you are probably not doing that out of malignity, but because you don’t see many women at tech conferences who are actually developers. Nevertheless, to the receiver, this seemingly harmless and neutral question doesn’t come across like that at all. She has probably heard this question many times, and constantly hearing doubts about whether you are really a programmer doesn’t exactly make you feel welcome, or confident. Show some empathy when you talk to other people at tech conferences. Imagine what it would be like to constantly be doubted, for example. If you don’t see a need for being inclusive, that’s probably because you had no problem being included in the community. This likely means that you are a man, and probably white. Since most people around you are like you, chances are you don’t even know any women or other unprivileged people who are developers. The problem of being privileged is that you don’t notice it. Talk to women on conferences and let them tell you about their experiences. By showing empathy, you can create a more welcoming environment of inclusion and foster diversity. These are my two cents about empathy, and lack thereof, in the tech community, and how it relates to inclusion and diversity. Empathy is important not only at the workplace, when interacting with co-workers, but also when we are participating in the tech community, as conference visitors, open source developers, and users of open source libraries. Only by showing empathy, we can create an inclusive and open community. Let’s try to be more aware of the effects we have on each other, and act accordingly. Thanks! Observation: People are using Option too often where their business logic clearly indicates they should use their own, custom ADT. Since 140 characters are not nearly enough to discuss this issue appropriately and there were a few questions around this whole topic, I decided to put my thoughts down in a blog post, providing a few examples of what I actually talking about. Option is great, Option is good! As Scala programmers, we can all give ourselves a pat on the back for being upright users of the Option type. Option is great! It allows us to express in types that a value may or may not be there. Option is good! It allows us to work with potentially missing values in a safe and elegant way, without having to check for presence all the time or risking those dreaded NullPointerExceptions. All hail Option! scala> Map("DE" -> "Germany", "FR" -> "France") get "DE"
@kaffeecoder An example: A Query type where empty means match everything. Have that in our code right now. Apparently, there are two search criteria you can provide to filter the results: the product, and the retailer offering the product. But what does this really mean? It looks like we have attached some new semantics to the Option type. 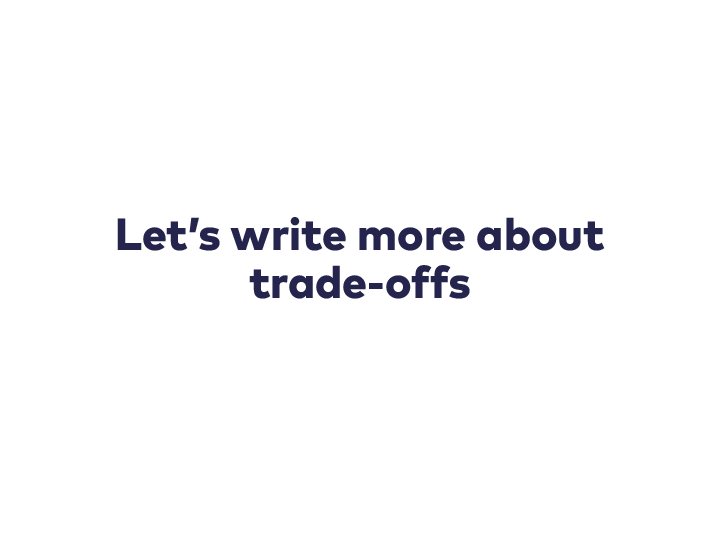 It seems that if productTitle is None, the user wants to search for all offers, regardless of the product title, which means that None has the meaning of a wildcard. However, if productTitle is a Some, is this supposed to be an exact match or does the provided search string just have to be contained in the product title? For the retailer, the same semantics might apply if the Option is undefined. Or maybe, in this case, None actually means that the user wants to search for offers that are not provided by a professional retailer. Who knows? As a team member seeing this code for the first time, or coming back to it after a few months, I would probably be confused. The problem is that we are overloading the semantics of None and Some. The former is very similar to how null in Java is sometimes used with meanings that are different from simple absence. Introducing your own algebraic data types here allows you to use to close the gap between the language of your domain and the one used in your code, bringing you closer to a ubiquitous language, one of the core values in domain-driven design. In this example, any confusion about whether the product title is an exact search in the Some case or whether None is a wildcard is now eliminated. In the searchOffers implementation, we can simply use pattern matching on the SearchCriteria and RetailerCriteria, and since they are sealed traits, we will get a warning if our pattern matching is not exhaustive, i.e. it does not cover all the cases. If you want to read more about algebraic data types and sealed traits in Scala, read this excellent blog post by Noel Welsh. Now, you might say that SearchCriteria and RetailerCriteria have the same shape as Option, apart from the fact that they are not generic. Wouldn’t it be good enough to use some type aliases then in order to get the benefits of the ubiquitous language? Since we are already using our own algebraic data types, no big refactorings should be necessary. 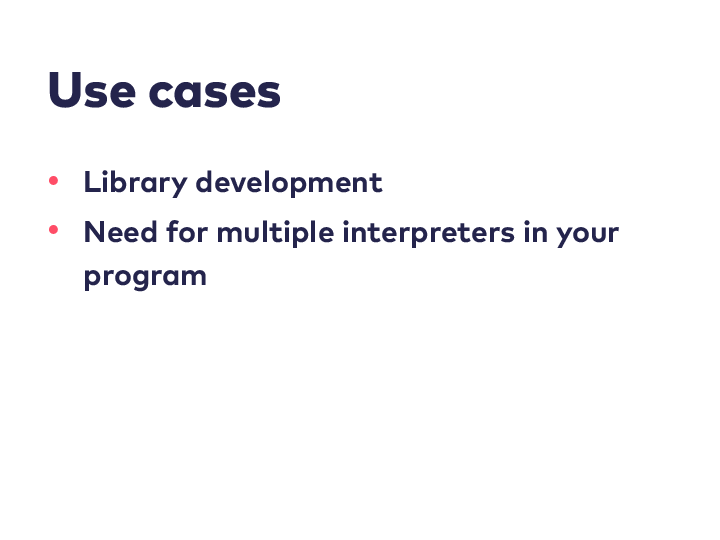 Of course, it is possible to encode the retailer criteria as an Either[Unit, Option[Retailer]], but can you tell me immediately what each of the possible cases is supposed to mean? The previous example was mainly about Option being used in function arguments. It seems like this is rarely a good idea. Here is another example where Option is used as a field of a case class and as a return type of a function, with confusing semantics. If the Option returned by checkTerritory is None, that’s the happy path and we can call the next filter in the chain. If it is defined, however, we need to short-circuit and immediately return a response informing the user that the content is blocked. Since Option is success-biased and short-circuits if it is None, this doesn’t look very intuitive to me. I find that to be a lot more readable, and again, it has the advantage that it is easier to extend this in the future with additional verdict types. It is often possible to express a concept from your domain as an Option, or if that doesn’t work, as an Either. Nevertheless, it is sometimes better to not use these generic types. If your actual semantics are different from potential absence of values, don’t force it, as this causes unnecessary indirection when reasoning about the code and the domain. Unsurprisingly, this can easily lead to bugs. The domain logic is easier to understand if you use your own types from the ubiquitous language. Do you have more examples from your projects where the lack of custom algebraic data types has led to bugs or code that is difficult to understand? Feel free to share those in the comments or via Twitter. When the access patterns of a service are such that there are a lot more reads than writes, a common practice for scaling it horizontally is to have the service talk to a master database only for operations that result in state changes, while all read-only operations are performed against one or more read slaves. Those read replicas are only eventually consistent with the master. This practice is an easy solution if you don’t want to or cannot go the full CQRS way. All you need to do is maintain two separate data sources and point all your write operations to the master, and all your read operations to your slave. However, how do you make sure that you’re actually putting your writes where your master is? It’s easy to accidentally get this wrong, and usually, you will only find out at runtime, when the read slave is denying your service to perform its writes. Wouldn’t it be nice if you could already verify at compile-time that your operations are hitting the correct database? With Slick 3, the latest version of Typesafe’s functional-relational mapper, this is actually very easy to do, provided you know a bit about Scala’s type system and Slick’s notion of database actions and effect types. In this blog post, I will explain all you need to know in order to restrict the evaluation of Slick database actions based on their effect types, resulting in the elimination of yet another source of bugs. The full example application on which the code snippets in this blog post are based is available on GitHub. Whether you want to query a table, insert or update a row, or update your database schema, in Slick 3, each of those things is expressed as a DBIOAction[+R, +S <: NoStream, -E <: Effect]. R is the result type of the action, and S indicates the result type for streaming results, where the super-type NoStream refers to non-streaming database actions. For this article, those two type parameters are not of importance, however. Let’s look at the third parameter instead. The Effect type is a so-called phantom type. This means that we never create any instances of Effect at runtime. Rather, the sole purpose of this type is to give additional information to the compiler, so that it can prevent certain error conditions before running the application. Here, the type of action returned by save is automatically inferred to be DBIOAction[Int, NoStream, Write]. The action returned by forId, on the other hand, is DBIOAction[Option[Status], NoStream, Read]. Having an effect type of Nothing means that Slick accepts database actions with any effect type, not caring about whether it is a Write, a Read, or something else. On the type level, you are not able to differentiate between your master and slave databases, so performing an undesired effect against one of your databases by accident is a very real issue. Luckily, with its Effect type, Slick 3 gives you all the compile-time information you need to implement a restriction of effect types for your own application. In order to restrict the effect types that are allowed for a certain database, we are going to attach a role (e.g. master or slave) to each database and associate certain privileges to each role that will then be checked when trying to run a database action – all at compile time. Like Slick’s Effect, our Role trait will never be instantiated in our application. The HasPrivilege phantom type is meant to provide implicit evidence that a certain role R is allowed to perform the Slick effect type E.
The @implicitNotFound annotation allows us to provide a custom error message for the case that no implicit evidence of HasPrivilege can be found, where it is required. As you can see, while we do provide evidences in terms of implicit vals, we don’t actually create any instances of HasPrivilege. Since the code that will make use of our evidence will never work with our implicit evidences at runtime, we can safely assign null here. Also, please not that Slave HasPrivilege Read is just another notation for HasPrivilege[Slave, Read]. Unfortunately, we have to provide an implicit evidence for every combination of effect types we want to allow. In this example, we want to allow combining reads with writes and transactions, but it’s not allowed to combine reads and writes without also using a transaction. Now, in order to actually restrict the database actions that can be run according to the role of the database, we need to introduce a wrapper around Slick’s DatabaseDef – as we saw earlier, the latter does not care about the type of effect, and of course, it doesn’t know anything about our roles. Our new wrapper type has a type parameter R that specifies its role, and it creates the underlying Slick DatabaseDef from an instance of DatabaseConfiguration with the same role, which we will look at in a moment. For now, the important thing is the run method on our DB class, which looks very similar to the Slick’s run method we saw earlier. The crucial difference is that our run method has a second type parameter E that specifies the type of effect of our action, and that our DBIOActions effect type parameter is that E instead of just Nothing. Moreover, our run method has a second, implicit parameter list, with evidence of HasPrivilege[R, E], i.e. that our database role R is privileged to execute the effect E.
Instead of using DatabaseDef directly, we will now always make use of our role-annotated DB. The DatabaseConfiguration is the one place where we interact with the untyped outside world, reading our database connection information for the respective key, databases.master or databases.slave. Hence, the only place where we can still get things wrong is in our application.conf configuration file, if we accidentally provide the wrong database host, for example. If you don’t do provide an explicit type here, the actions’s effect type parameter will be inferred to be Effect, the super type of all effect types. Since Effect is not a sealed trait, you may introduce your own effect types and prevent certain databases from performing those effects. If you accidentally use a DB[Master] in this read service, you will get a compile error. Of course, once you have to start annotating your database action explicitly in order to benefit from these compile-time checks, you are prone to another source of errors. Failing to annotate your actions correctly may lead to the same kinds of runtime errors we wanted to prevent. In this article I have shown how to use Slick’s Effect type, together with a few other phantom types, in order to have your compiler help you verify that you run your Slick database actions against the correct database. While it’s possible to use this technique with plain SQL queries and custom effect types, the greatest benefit will come in cases where you only use lifted embedding and the standard effect types. Thanks a lot to @missingfaktor who collaborated with me on developing this technique on top of Slick 3 and gave a lot of valuable input. As I have already hinted at in the previous article, the Neophyte’s Guide to Scala is coming to an end. Over the last five months, we have delved into numerous language and library features of Scala, hopefully deepening your understanding of those features and their underlying ideas and concepts. As such, I hope this guide has served you well as a supplement to whatever introductory resources you have been using to learn Scala, whether you attended the Scala course at Coursera or learned from a book. I have tried to cover all the quirks I stumbled over back when I learned the language – things that were only mentioned briefly or not covered at all in the books and tutorials available to me – and I hope that especially those explanations were of value to you. As the series progressed, we ventured into more advanced territory, covering ideas like type classes and path-dependent types. While I could go on writing about more and more arcane features, I felt like this would go against the idea of this series, which is clearly targeted at aspiring neophytes. Hence, I will conclude this series with some suggestions of where to go from here if you want more. Rest assured that I will continue blogging about Scala, just not within the context of this series. How you want to continue your journey with Scala, of course, depends a lot on your individual preferences: Maybe you are now at a point where you would like to teach Scala to others, or maybe you are excited about Scala’s type system and would like to explore some of the language’s more arcane features by delving into type-level programming. More often than not, a good way to really get comfortable with a new language and its whole ecosystem of libraries is to use it for creating something useful, i.e. a real application that is more than just toying around. Personally, I have also gained a lot from contributing to open source projects early on. In the following, I will elaborate those four paths, which, of course, are not mutually exclusive, and provide you with numerous links to highly recommendable additional resources. Having followed this series, you should be familiar enough with Scala to be able to teach the basics. Maybe you are in a Java or Ruby shop and want to get your coworkers excited about Scala and functional programming. Great, then why not organize a workshop? 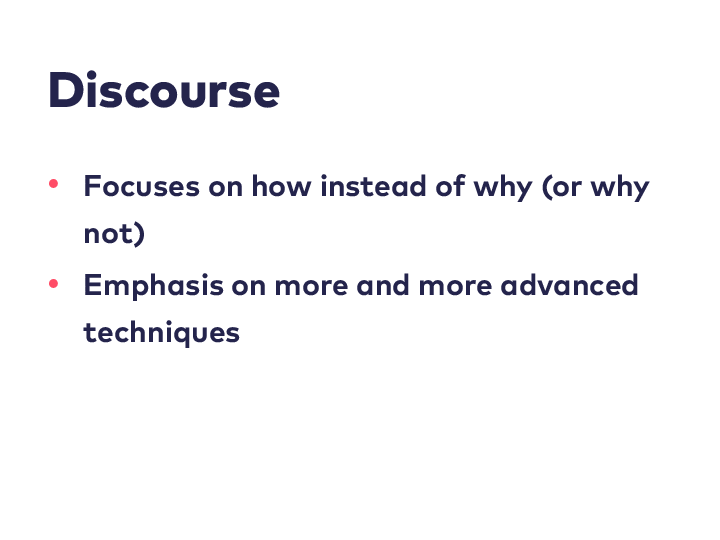 A nice way of introducing people to a new language is to not do a talk with lots of slides, but to teach by example, introducing a language in small steps by solving tiny problems together. Active participation is key! If that’s something you’d like to do, the Scala community has you covered. Have a look at Scala Koans, a collection of small lessons, each of which provides a problem to be solved by fixing an initially failing test. 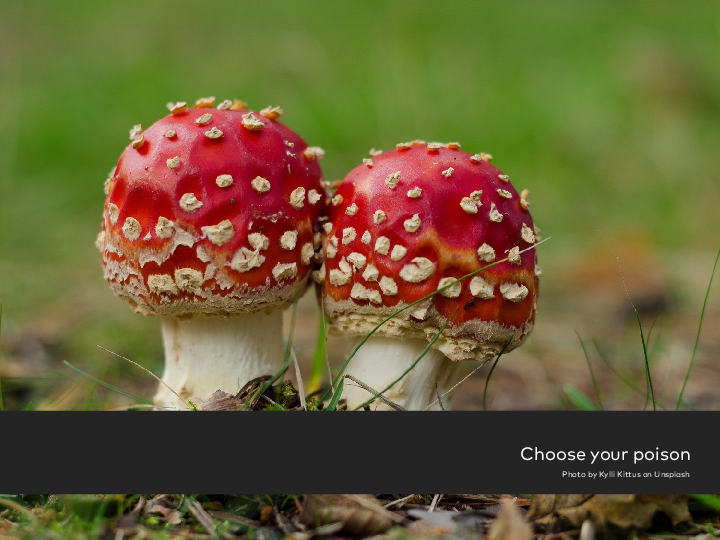 The project is inspired by the Ruby Koans project and is a really good resource for teaching the language to others in small collaborative coding sessions. Another amazing project ideally suited for workshops or other events is Scalatron, a game in which bots fight against each other in a virtual arena. Why not teach the language by developing such a bot together in a workshop, that will then fight against the computer? Once the participants are familiar enough with the language, organize a tournament, where each participant will develop their own bot. We have only seen a tiny bit of what the Scala type system allows you to do. If this small hint at the high wizardry that’s possible got you excited and you want to master the arcane powers of type-level programming, a good starting resource is the blog series Type-Level Programming in Scala by Mark Harrah. After that, I recommend to have a look at Shapeless, a library in which Miles Sabin explores the limits of the Scala language in terms of generic and polytypic programming. Reading books, doing tutorials and toying around with a new language is all fine to get a certain understanding of it, but in order to become really comfortable with Scala and its paradigm and learn how to think the Scala way, I highly recommend that you start creating something useful with it – something that is clearly more than a toy application (this is true for learning any language, in my opinion). By tackling a real-world problem and trying to create a useful and usable application, you will also get a good overview of the ecosystem of libraries and get a feeling for which of those can be of service to you in specific situations. In order to find relevant libraries or get updates of ones you are interested in, you should subscribe to implicit.ly and regularly take a look at Scala projects on GitHub. These days, most applications written in Scala will be some kind of server applications, often with a RESTful interface exposed via HTTP and a web frontend. If the actor model for concurrency is a good fit for your use case and you hence choose to use the Akka toolkit, an excellent choice for exposing a REST API via HTTP is Spray Routing. This is a great tool if you don’t need a web frontend, or if you want to develop a single-page web application that will talk to your backend by means of a REST API. 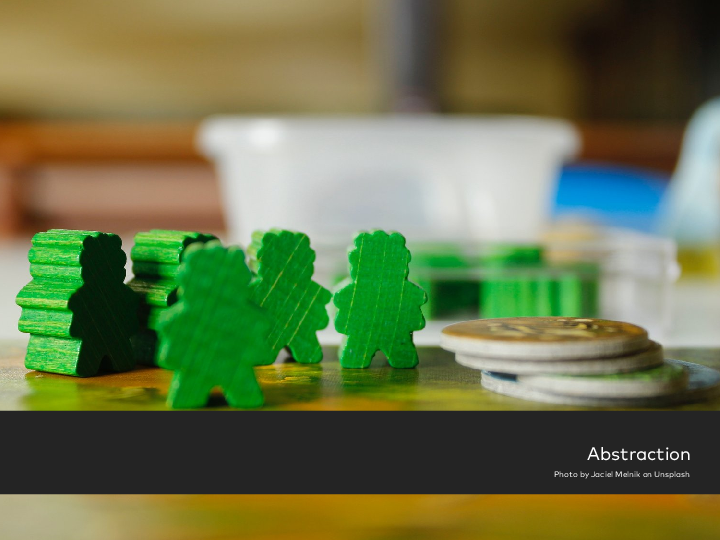 If you need something less minimalistic, of course, Play, which is part of the Typesafe stack, is a good choice, especially if you seek something that is widely adopted and hence well supported. If after our two parts on actors and Akka, you think that Akka is a good fit for your application, you will likely want to learn a lot more about it before getting serious with it. While the Akka documentation is pretty exhaustive and thus serves well as a reference, I think that the best choice for actually learning Akka is Derek Wyatt’s book Akka Concurrency, a preliminary version of which is already available as a PDF. Once you have got serious with Akka, you should definitely subscribe to Let It Crash, which provides you with news and advanced tips and tricks and regarding all things Akka. If actors are not your thing and you prefer a concurrency model allowing you to leverage the composability of Futures, your library of choice is probably Twitter’s Finagle. It allows you to modularize your application as a bunch of small remote services, with support for numerous popular protocols out of the box. Another really great way to learn a lot about Scala quickly is to start contributing to one or more open source projects – preferably to libraries you have been using while working on your own application. Of course, this is nothing that is specific to Scala, but still I think it deserves to be mentioned. If you have only just learned Scala and are not using it at your day job already, it’s nearly the only choice you have to learn from other, more experienced Scala developers. It forces you to read a lot of Scala code from other people, discovering how to do things differently, possibly more idiomatically, and you can have those experienced developers review your code in pull requests. I have found the Scala community at large to be very friendly and helpful, so don’t shy away from contributing, even if you think you’re too much of a rookie when it comes to Scala. While some projects might have their own way of doing things, it’s certainly a good idea to study the Scala Style Guide to get familiar with common coding conventions. By contributing to open source projects, you have already started connecting with the Scala community. However, you may not have the time to do that, or you may prefer other ways of connecting to like-minded people. Try finding a local Scala user group or meetup. Scala Tribes provides an overview of Scala communities across the globe, and the Scala topic at Lanyrd keeps you up-to-date on any kind of Scala-related event, from conferences to meetups. If you don’t like connecting in meatspace, the scala-user mailing list/Google group and the Scala IRC channel on Freenode may be good alternatives. Functional Programming in Scala by Paul Chiusano and Rúnar Bjarnason, which is currently available as an Early Access Edition and teaches you a lot more about functional programming and thinking about problems with a functional mindset. The Scala Documentation Site, which, for some reason, is not linked very prominently from the main Scala website, especially the available guides and tutorials. Resources for Getting Started With Functional Programming and Scala by Kelsey Innis contains a lot more helpful links about some of the topics we covered in this series. I hope you have enjoyed this series and that I could get you excited about Scala. While this series is coming to an end, I seriously hope that it’s just the beginning of your journey through Scala land. Let me know in the comments how your journey went so far and where you think it will go from here. In the previous part of this series, I introduced you to the second cornerstone of Scala concurrency: The actor model, which complements the model based on composable futures backed by promises. You learnt how to define and create actors, how to send messages to them and how an actor processes these messages, possibly modifying its internal state as a result or asynchronously sending a response message to the sender. While that was hopefully enough to get you interested in the actor model for concurrency, I left out some crucial concepts you will want to know about before starting to develop actor-based applications that consist of more than a simple echo actor. The actor model is meant to help you achieve a high level of fault tolerance. 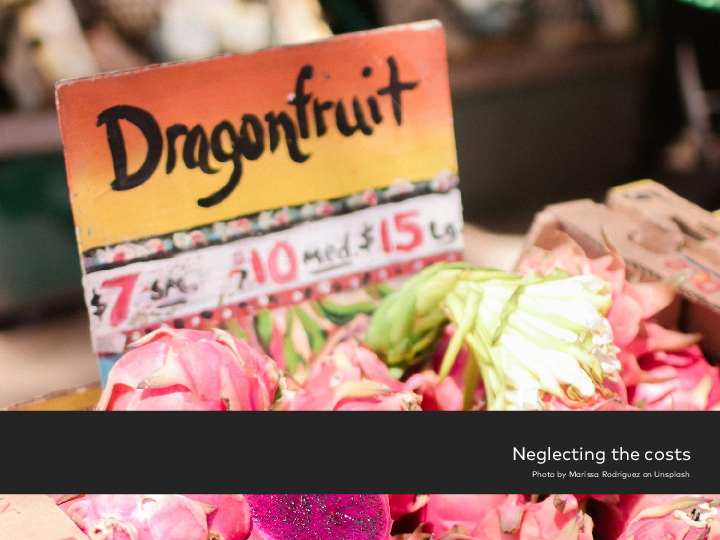 In this article, we are going to have a look at how to deal with failure in an actor-based application, which is fundamentally different from error handling in a traditional layered server architecture. The way you deal with failure is closely linked to some core Akka concepts and to some of the elements an actor system in Akka consists of. Hence, this article will also serve as a guide to those ideas and components. Before going into what happens when an error occurs in one of your actors, it’s essential to introduce one crucial idea underlying the actor approach to concurrency – an idea that is the very foundation for allowing you to build fault-tolerant concurrent applications: Actors are organized in a hierarchy. So what does this mean? First of all, it means that every single of your actors has got a parent actor, and that each actor can create child actors. Basically, you can think of an actor system as a pyramid of actors. Parent actors watch over their children, just as in real life, taking care that they get back on their feet if they stumble. You will see shortly how exactly this is done. As you can see, we create these two actors by calling the actorOf method defined on the ActorSystem type. So what is the parent of these two actors? Is it the actor system? Not quite, but close. The actor system is not an actor itself, but it has got a so-called guardian actor that serves as the parent of all root-level user actors, i.e. actors we create by calling actorOf on our actor system. There shouldn’t be a whole lot of actors in your system that are children of the guardian actor. It really makes more sense to have only a few top-level actors, each of them delegating most of the work to their children. The akka protocol is followed by the name of our actor system, the name of the user guardian actor and, finally, the name we gave our actor when calling actorOf on the system. In the case of remote actors, running on different machines, you would additionally see a host and a port. However, while being able to look up an actor by its path can sometimes come in handy, it’s often a much better idea to pass in dependencies in the constructor, just as we did before. Too much intimate knowledge about where your dependencies are located in the actor system makes your system more susceptible to bugs, and it will be difficult to refactor later on. To illustrate how parents watch over their children and what this has got to do with keeping your system fault-tolerant, I’m going to stick to the domain of the coffeehouse. Let’s give the Barista actor a child actor to which it can delegate some of the work involved in running a coffeehouse. If we really were to model the work of a barista, we were likely giving them a bunch of child actors for all the various subtasks. But to keep this article focused, we have to be a little simplistic with our example. It contains an immutable map of the prices for each article, and an integer variable representing the revenue. Whenever it receives a Transaction message, it increments the revenue accordingly and returns a printed receipt to the sender. First off, we define the message types that our Barista actor is able to deal with. An EspressoCup can have one out of a fixed set of states, which we ensure by using a sealed trait. The more interesting part is to be found in the implementation of the Barista class. The dispatcher, ask, and pipe imports as well as the implicit timeout are required because we make use of Akka’s ask syntax and futures in our Receive partial function: When we receive an EspressoRequest, we ask the Register actor for a Receipt for our Transaction. This is then combined with a filled espresso cup and piped to the sender, which will thus receive a tuple of type (EspressoCup, Receipt). This kind of delegating subtasks to child actors and then aggregating or amending their work is typical for actor-based applications. Also, note how we create our child actor by calling actorOf on our ActorContext instead of the ActorSystem. By doing so, the actor we create becomes a child actor of the one who called this method, instead of a top-level actor whose parent is the guardian actor. It is not terribly interesting for our tutorial, which focuses more on the Barista actor hierarchy. What’s new is the use of the ActorLogging trait, which allows us to write to the log instead of printing to the console. If you try this out, you should see two log messages from happy customers. Of course, what we are really interested in, at least in this article, is not happy customers, but the question of what happens if things go wrong. Now, when processing a Transaction message, our Register actor will throw a PaperJamException in about half of the cases. What effect does this have on our actor system, or on our whole application? Luckily, Akka is very robust and not affected by exceptions in our code at all. What happens, though, is that the parent of the misbehaving child is notified – remember that parents are watching over their children, and this is the situation where they have to decide what to do. The whole act of being notified about exceptions in child actors, however, is not handled by the parent actor’s Receive partial function, as that would confound the parent actor’s own behaviour with the logic for dealing with failure in its children. Instead, the two responsibilities are clearly separated. Each actor defines its own supervisor strategy, which tells Akka how to deal with certain types of errors occurring in your children. There are basically two different types of supervisor strategy, the OneForOneStrategy and the AllForOneStrategy. Choosing the former means that the way you want to deal with an error in one of your children will only affect the child actor from which the error originated, whereas the latter will affect all of your child actors. Which of those strategies is best depends a lot on your individual application. Regardless of which type of SupervisorStrategy you choose for your actor, you will have to specify a Decider, which is a PartialFunction[Throwable, Directive] – this allows you to match against certain subtypes of Throwable and decide for each of them what’s supposed to happen to your problematic child actor (or all your child actors, if you chose the all-for-one strategy). Resume: If you choose to Resume, this probably means that you think of your child actor as a little bit of a drama queen. You decide that the exception was not so exceptional after all – the child actor or actors will simply resume processing messages as if nothing extraordinary had happened. Restart: The Restart directive causes Akka to create a new instance of your child actor or actors. The reasoning behind this is that you assume that the internal state of the child/children is corrupted in some way so that it can no longer process any further messages. By restarting the actor, you hope to put it into a clean state again. Stop: You effectively kill the actor. It will not be restarted. Escalate: If you choose to Escalate, you probably don’t know how to deal with the failure at hand. You delegate the decision about what to do to your own parent actor, hoping they are wiser than you. If an actor escalates, they may very well be restarted themselves by their parent, as the parent will only decide about its own child actors. This means that for exceptions other than ActorInitializationException or ActorKilledException, the respective child actor in which the exception was thrown will be restarted. Hence, when a PaperJamException occurs in our Register actor, the supervisor strategy of the parent actor (the barista) will cause the Register to be restarted, because we haven’t overridden the default strategy. If you try this out, you will likely see an exception stacktrace in the log, but nothing about the Register actor being restarted. Let’s verify that this is really happening. To do so, however, you will need to learn about the actor lifecycle. To understand what the directives of a supervisor strategy actually do, it’s crucial to know a little bit about an actor’s lifecycle. Basically, it boils down to this: when created via actorOf, an actor is started. It can then be restarted an arbitrary number of times, in case there is a problem with it. Finally, an actor can be stopped, ultimately leading to its death. preStart: Called when an actor is started, allowing you to do some initialization logic. The default implementation is empty. postStop: Empty by default, allowing you to clean up resources. Called after stop has been called for the actor. preRestart: Called right before a crashed actor is restarted. By default, it stops all children of that actor and then calls postStop to allow cleaning up of resources. postRestart: Called immediately after an actor has been restarted. Simply calls preStart by default. Now, if you send the two Customer actors a bunch of CaffeineWithdrawalWarning messages, you should see the one or the other of those log outputs, confirming that our Register actor has been restarted. Ouch! Something is clearly not as it should be. In the log, you will see the revenue increasing, but as soon as there is a paper jam and the Register actor restarts, it is reset to 0. 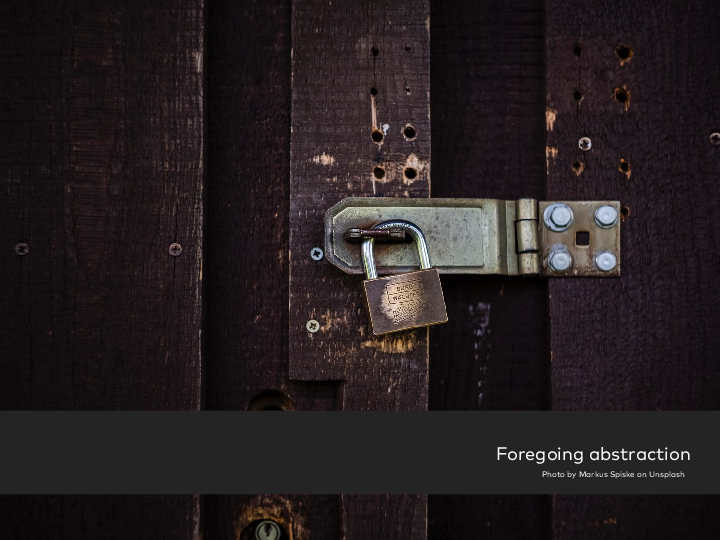 This is because restarting indeed means that the old instance is discarded and a new one created as per the Props we initially passed to actorOf. Now, the actor is not restarted upon a PaperJamException, so its state is not reset. So we just found a nice solution to preserve the state of our Register actor, right? Also remove the supervisor strategy we added to the Barista actor. Now, the paper jam remains forever, until we have restarted the actor. Alas, we cannot do that without also losing important state regarding our revenue. This is where the error kernel pattern comes in. Basically, it is just a simple guideline you should always try to follow, stating that if an actor carries important internal state, then it should delegate dangerous tasks to child actors, so as to prevent the state-carrying actor from crashing. Sometimes, it may make sense to spawn a new child actor for each such task, but that’s not a necessity. The essence of the pattern is to keep important state as far at the top of the actor hierarchy as possible, while pushing error-prone tasks as far to the bottom of the hierarchy as possible. Again, we simulate the paper jam with a boolean flag and throw an exception each time someone asks us to print a receipt while in a paper jam. Other than the new message type, PrintJob, this is really just extracted from the Register type. We don’t spawn a new ReceiptPrinter for each Transaction message we get. Instead, we use the default supervisor strategy to have the printer actor restart upon failure. One part that merits explanation is the weird way we increment our revenue: First we ask the printer for a receipt. 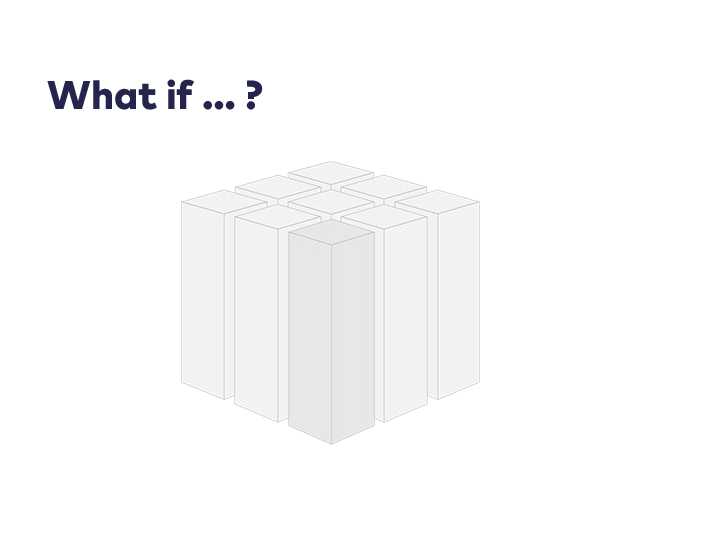 We map the future to a tuple containing the answer as well as the requester, which is the sender of the Transaction message and pipe this to ourselves. When processing that message, we finally increment the revenue and send the receipt to the requester. The reason for that indirection is that we want to make sure that we only increment our revenue if the receipt was successfully printed. Since it is vital to never ever modify the internal state of an actor inside of a future, we have to use this level of indirection. It helps us make sure that we only change the revenue within the confines of our actor, and not on some other thread. Assigning the sender to a val is necessary for similar reasons: When mapping a future, we are no longer in the context of our actor either – since sender is a method, it would now likely return the reference to some other actor that has sent us a message, not the one we intended. Now, our Register actor is safe from constantly being restarted, yay! Of course, the very idea of having the printing of the receipt and the management of the revenue in one place is questionable. Having them together came in handy for demonstrating the error kernel pattern. Yet, it would certainly be a lot better to seperate the receipt printing from the revenue management altogether, as these are two concerns that don’t really belong together. Another thing that we may want to improve upon is the handling of timeouts. Currently, when an exception occurs in the ReceiptPrinter, this leads to an AskTimeoutException, which, since we are using the ask syntax, comes back to the Barista actor in an unsuccessfully completed Future. Since the Barista actor simply maps over that future (which is success-biased) and then pipes the transformed result to the customer, the customer will also receive a Failure containing an AskTimeoutException. The Customer didn’t ask for anything, though, so it is certainly not expecting such a message, and in fact, it currently doesn’t handle these messages. Let’s be friendly and send customers a ComebackLater message – this is a message they already understand, and it makes them try to get an espresso at a later point. This is clearly better, as the current solution means they will never know that they will not get their espresso. Now, the Customer actors know they can try their luck later, and after trying often enough, they should finally get their eagerly anticipated espresso. Another principle that is important in order to keep your system fault-tolerant is to keep a watch on important dependencies – dependencies as opposed to children. Sometimes, you have actors that depend on other actors without the latter being their children. This means that they can’t be their supervisors. Yet, it is important to keep a watch on their state and be notified if bad things happen. Think, for instance, of an actor that is responsible for database access. You will want actors that require this actor to be alive and healthy to know when that is no longer the case. Maybe you want to switch your system to a maintenance mode in such a situation. For other use cases, simply using some kind of backup actor as a replacement for the dead actor may be a viable solution. We start watching our coffeeSource in our constructor, and we added a new case for messages of type Terminated – this is the kind of message we will receive from Akka if an actor we watch dies. Now, if we send a ClosingTime to the message and the Barista tells its context to stop itself, the Customer actors will be notified. Give it a try, and you should see their output in the log. Instead of simply logging that we are not amused, this could just as well initiate some failover logic, for instance. In this part of the series, which is the second one dealing with actors and Akka, you got to know some of the important components of an actor system, all while learning how to put the tools provided by Akka and the ideas behind it to use in order to make your system more fault-tolerant. While there is still a lot more to learn about the actor model and Akka, we shall leave it at that for now, as this would go beyond the scope of this series. In the next part, which shall bring this series to a conclusion, I will point you to a bunch of Scala resources you may want to peruse to continue your journey through Scala land, and if actors and Akka got you excited, there will be something in there for you, too. 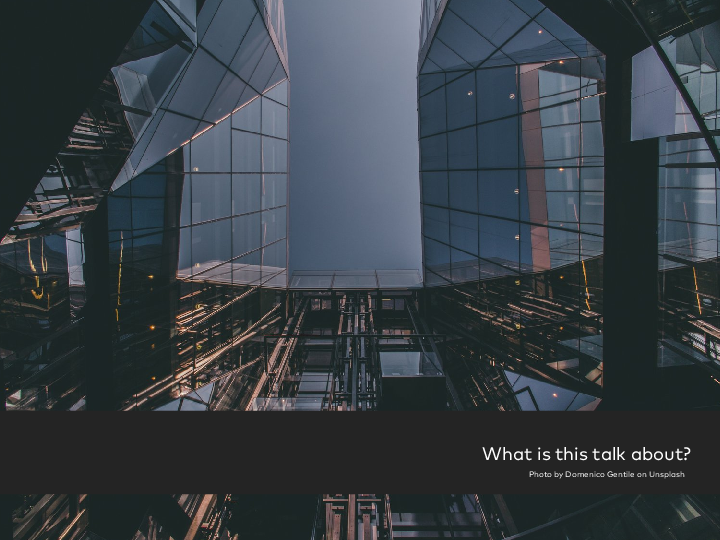 After several articles about how you can leverage the Scala type system to achieve a great amount of both flexibility and compile-time safety, we are now shifting back to a topic that we already tackled previously in this series: Scala’s take on concurrency. In these earlier articles, you learned about an approach that allows you to work asynchronously by making use of composable Futures. This approach is a very good fit for numerous problems. However, it’s not the only one Scala has to offer. A second cornerstone of Scala concurrency is the Actor model. It provides an approach to concurrency that is entirely based on passing messages between processes. Actors are not a new idea – the most prominent implementation of this model can be found in Erlang. 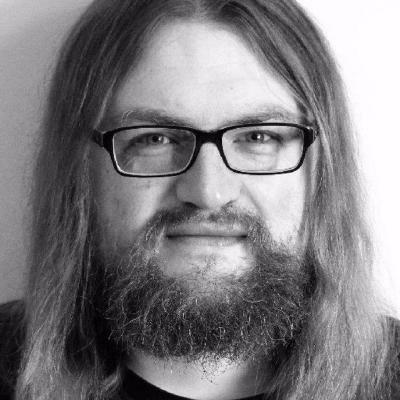 The Scala core library has had its own actors library for a long time, but it faces the destiny of deprecation in the coming Scala version 2.11, when it will ultimately be replaced by the actors implementation provided by the Akka toolkit, which has been a de-facto standard for actor-based development with Scala for quite a while. In this article, you will be introduced to the rationale behind Akka’s actor model and learn the basics of coding within this paradigm using the Akka toolkit. It is by no means an in-depth discussion of everything you need to know about Akka actors, and in that, it differs from most of the previous articles in this series. Rather, the intention is to familiarize you with the Akka mindset and serve as an initial spark to get you excited about it. The predominant approach to concurrency today is that of shared mutable state – a large number of stateful objects whose state can be changed by multiple parts of your application, each running in their own thread. Typically, the code is interspersed with read and write locks, to make sure that the state can only be changed in a controlled way and prevent multiple threads from mutating it simultaneously. At the same time, we are trying hard not to lock too big a block of code, as this can drastically slow down the application. More often than not, code like this has originally been written without having concurrency in mind at all – only to be made fit for a multi-threaded world once the need arose. While writing software without the need for concurrency like this leads to very straightforward code, adapting it to the needs of a concurrent world leads to code that is really, really difficult to read and understand. The core problem is that low-level synchronization constructs like locks and threads are very hard to reason about. 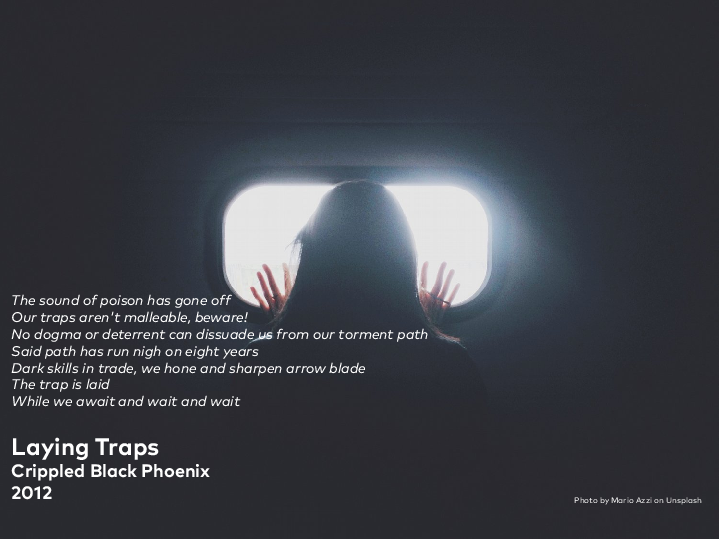 As a consequence, it’s very hard to get it right: If you can’t easily reason about what’s going on, you can be sure that nasty bugs will ensue, from race conditions to deadlocks or just strange behaviour – maybe you’ll only notice after some months, long after your code has been deployed to your production servers. Also, working with these low-level constructs makes it a real challenge to achieve an acceptable performance. The Actor programming model is aimed at avoiding all the problems described above, allowing you to write highly performant concurrent code that is easy to reason about. Unlike the widely used approach of shared mutable state, it requires you to design and write your application from the ground up with concurrency in mind – it’s not really possible to add support for it later on. The idea is that your application consists of lots of light-weight entities called actors. Each of these actors is responsible for only a very small task, and is thus easy to reason about. A more complex business logic arises out of the interaction between several actors, delegating tasks to others or passing messages to collaborators for other reasons. Actors are pitiful creatures: They cannot live on their own. Rather, each and every actor in Akka resides in and is created by an actor system. Aside from allowing you to create and find actors, an ActorSystem provides for a whole bunch of additional functionality, none of which shall concern us right now. resolvers += "Typesafe Releases" at "http://repo.typesafe.com/typesafe/releases"
libraryDependencies += "com.typesafe.akka" %% "akka-actor" % "2.2.3"
We created a new instance of ActorSystem and gave it the name "Barista" – we are returning to the domain of coffee, which should be familiar from the article on composable futures. Finally, we are good citizens and shut down our actor system once we no longer need it. Whether your application consists of a few dozen or a few million actors totally depends on your use case, but Akka is absolutely okay with a few million. You might be baffled by this insanely high number. It’s important to understand that there is not a one-to-one relationship between an actor and a thread. You would soon run out of memory if that were the case. Rather, due to the non-blocking nature of actors, one thread can execute many actors – switching between them depending on which of them has messages to be processed. First, we define the types of messages that our actor understands. Typically, case classes are used for messages sent between actors if you need to pass along any parameters. If all the actor needs is an unparameterized message, this message is typically represented as a case object – which is exactly what we are doing here. In any case, it’s crucial that your messages are immutable, or else bad things will happen. Next, let’s have a look at our class Barista, which is the actual actor, extending the aptly named Actor trait. Said trait defines a method receive which returns a value of type Receive. The latter is really only a type alias for PartialFunction[Any, Unit]. So what’s the meaning of this receive method? The return type, PartialFunction[Any, Unit] may seem strange to you in more than one respect. In a nutshell, the partial function returned by the receive method is responsible for processing your messages. Whenever another part of your software – be it another actor or not – sends your actor a message, Akka will eventually let it process this message by calling the partial function returned by your actor’s receive method, passing it the message as an argument. When processing a message, an actor can do whatever you want it to, apart from returning a value. As the return type of Unit suggests, your partial function is side-effecting. This might come as a bit of a shock to you after we emphasized the usage of pure functions all the time. For a concurrent programming model, this actually makes a lot of sense. Actors are where your state is located, and having some clearly defined places where side-effects will occur in a controllable manner is totally fine – each message your actor receives is processed in isolation, one after another, so there is no need to reason about synchronization or locks. But… this partial function is not only side-effecting, it’s also as untyped as you can get in Scala, expecting an argument of type Any. Why is that, when we have such a powerful type system at our fingertips? This has a lot to do with some important design choices in Akka that allow you to do things like forwarding messages to other actors, installing load balancing or proxying actors without the sender having to know anything about them and so on. In practice, this is usually not a problem. With the messages themselves being strongly typed, you typically use pattern matching for processing those types of messages you are interested in, just as we did in our tiny example above. Sometimes though, the weakly typed actors can indeed lead to nasty bugs the compiler can’t catch for you. If you have grown to love the benefits of a strong type system and think you don’t want to go away from that at any costs for some parts of your application, you may want to look at Akka’s new experimental Typed Channels feature. I wrote above that Akka would let your actor eventually process a message sent to it. This is important to keep in mind: Sending a message and processing it is done in an asynchronous and non-blocking fashion. The sender will not be blocked until the message has been processed by the receiver. Instead, they can immediately continue with their own work. Maybe they expect to get a messsage from your actor in return after a while, or maybe they are not interested in hearing back from your actor at all. What really happens when some component sends a message to an actor is that this message is delivered to the actor’s mailbox, which is basically a queue. Placing a message in an actor’s mailbox is a non-blocking operation, i.e. the sender doesn’t have to wait until the message is actually enqueued in the recipient’s mailbox. The dispatcher will notice the arrival of a new message in an actor’s mailbox, again asynchronously. If the actor is not already processing a previous message, it is now allocated to one of the threads available in the execution context. Once the actor is done processing any previous messages, the dispatcher sends it the next message from its mailbox for processing. The actor blocks the thread to which it is allocated for as long as it takes to process the message. While this doesn’t block the sender of the message, it means that lengthy operations degrade overall performance, as all the other actors have to be scheduled for processing messages on one of the remaining threads. Hence, a core principle to follow for your Receive partial functions is to spend as little time inside them as possible. Most importantly, avoid calling blocking code inside your message processing code, if possible at all. Of course, this is something you can’t prevent doing completely – the majority of database drivers nowadays is still blocking, and you will want to be able to persist data or query for it from your actor-based application. There are solutions to this dilemma, but we won’t cover them in this introductory article. The actorOf method defined on ActorSystem expects a Props instance, which provides a means of configuring newly created actors, and, optionally, a name for your actor instance. We are using the simplest form of creating such a Props instance, providing the apply method of the companion object with a type parameter. Akka will then create a new instance of the actor of the given type by calling its default constructor. Be aware that the type of the object returned by actorOf is not Barista, but ActorRef. Actors never communicate with another directly and hence there are supposed to be no direct references to actor instances. Instead, actors or other components of your application aquire references to the actors they need to send messages to. Thus, an ActorRef acts as some kind of proxy to the actual actor. This is convenient because an ActorRef can be serialized, allowing it to be a proxy for a remote actor on some other machine. For the component aquiring an ActorRef, the location of the actor – local in the same JVM or remote on some other machine – is completely transparent. We call this property location transparency. Please note that ActorRef is not parameterized by type. Any ActorRef can be exchanged for another, allowing you to send arbitrary messages to any ActorRef. This is by design and, as already mentioned above, allows for easily modifying the topology of your actor system wihout having to make any changes to the senders. Calling the ! is a fire-and-forget operation: You tell the Barista that you want a cappuccino, but you don’t wait for their response. It’s the most common way in Akka for interacting with other actors. By calling this method, you tell Akka to enqueue your message in the recipient’s mailbox. As described above, this doesn’t block, and eventually the recipient actor will process your message. I have to prepare a cappuccino! Even though we first sent the two messages to the Barista actor’s mailbox, between the processing of the first and second message, our own output is printed to the console. Sometimes, being able to tell others what to do just doesn’t cut it. You would like to be able to answer by in turn sending a message to the sender of a message you got – all asynchronously of course. To enable you to do that and lots of other things that are of no concern to us right now, actors have a method called sender, which returns the ActorRef of the sender of the last message, i.e. the one you are currently processing. When called from an actor, its ActorRef is passed on as the implicit sender argument. While we are at it, we are introducing a new message, ClosingTime. The Barista reacts to it by shutting down the actor system, which they, like all actors, can access via their ActorContext. This actor is a real coffee junkie, so it needs to be able to order new coffee. We pass it an ActorRef in the constructor – for the Customer, this is simply its caffeineSource – it doesn’t know whether this ActorRef points to a Barista or something else. It knows that it can send CoffeeRequest messages to it, and that is all that matters to them. Here, for the Customer actor, we are using a different factory method for creating a Props instance: We pass in the type of the actor we want to have instantiated as well as the constructor arguments that actor takes. We need to do this because we want to pass the ActorRef of our Barista actor to the constructor of the Customer actor. I have to pay 200 cents, or else! First, while processing the EspressoRequest message, the Barista sends a message to the sender of that message, the Customer actor. However, this operation doesn’t block until the latter processes it. The Barista actor can continue processing the EspressoRequest immediately, and does this by printing to the console. Shortly after, the Customer starts to process the Bill message and in turn prints to the console. Sometimes, sending an actor a message and expecting a message in return at some later time isn’t an option – the most common place where this is the case is in components that need to interface with actors, but are not actors themselves. Living outside of the actor world, they cannot receive messages. First, you need to import support for the ask syntax and create an implicit timeout for the Future returned by the ? method. Also, the Future needs an ExecutionContext. Here, we simply use the default dispatcher of our ActorSystem, which is conveniently also an ExecutionContext. As you can see, the returned future is untyped – it’s a Future[Any]. This shouldn’t come as a surprise, since it’s really a received message from an actor, and those are untyped, too. For the actor that is being asked, this is actually the same as sending some message to the sender of a processed message. This is why asking our Barista works out of the box without having to change anything in our Barista actor. Once the actor being asked sends a message to the sender, the Promise belonging to the returned Future is completed. Generally, telling is preferable to asking, because it’s more resource-sparing. Akka is not for polite people! However, there are situations where you really need to ask, and then it’s perfectly fine to do so. Each actor may maintain an internal state, but that’s not strictly necessary. Sometimes, a large part of the overall application state consists of the information carried by the immutable messages passed between actors. An actor only ever processes one message at a time. While doing so, it may modify its internal state. This means that there is some kind of mutable state in an actor, but since each message is processed in isolation, there is no way the internal state of our actor can get messed up due to concurrency problems. We introduced two vars, cappuccinoCount and espressoCount that are incremented with each respective order. This is actually the first time in this series that we have used a var. While to be avoided in functional programming, they are really the only way to allow your actors to carry state. Since each message is processed in isolation, our above code is similar to using AtomicInteger values in a non-actor environment. And here ends our introduction to the actor programming model for concurrency and how to work within this paradigm using Akka. While we have really only scratched the surface and have ignored some important concepts of Akka, I hope to have given enough of an insight into this approach to concurrency to give you a basic understanding and get you interested in learning more. In the coming articles, I will elaborate our little example, adding some meaningful behaviour to it while introducing more of the ideas behind Akka actors, among them the question of how errors are handled in an actor system. P.S. Please note that starting with this article I have switched to a biweekly schedule for the remaining parts of this series. In last week’s article, I introduced you to the idea of type classes – a pattern that allows you to design your programs to be open for extension without giving up important information about concrete types. This week, I’m going to stick with Scala’s type system and talk about one of its features that distinguishes it from most other mainstream programming languages: Scala’s form of dependent types, in particular path-dependent types and dependent method types. One of the most widely used arguments against static typing is that “the compiler is just in the way” and that in the end, it’s all only data, so why care about building up a complex hierarchy of types? In the end, having static types is all about preventing bugs by allowing the über-smart compiler to humiliate you on a regular basis, making sure you’re doing the right thing before it’s too late. 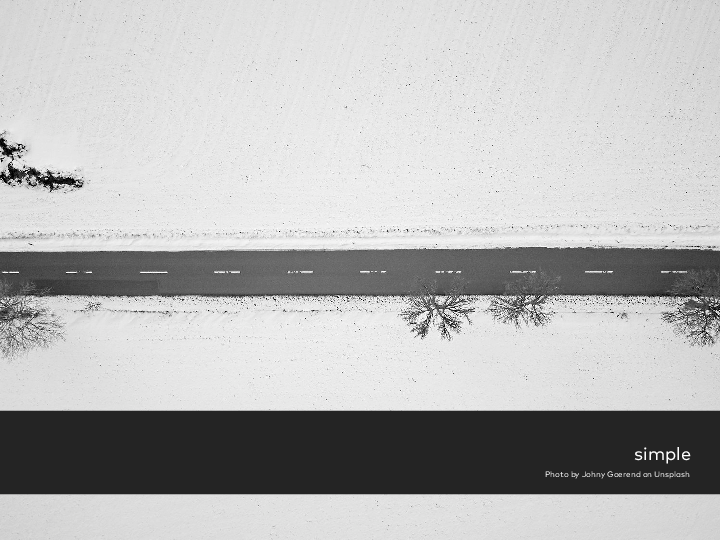 Using path-dependent types is one powerful way to help the compiler prevent you from introducing bugs, as it places logic that is usually only available at runtime into types. Sometimes, accidentally introducing path-dependent types can lead to frustation, though, especially if you have never heard of them. Hence, it’s definitely a good idea to get familiar with them, whether you decide to put them to use or not. I will start by presenting a problem that path-dependent types can help us solving: In the realm of fan fiction, the most atrocious things happen – usually, the involved characters will end up making out with each other, regardless how inappropriate it is. There is even crossover fan fiction, in which two characters from different franchises are making out with each other. Now, the Character instances have a reference to their Franchise, and trying to create a fan fiction with characters from different franchises will lead to an IllegalArgumentException (feel free to try this out in a REPL). This is pretty good, isn’t it? It’s the kind of fail-fast behaviour we have been indoctrinated with for years. However, with Scala, we can do better. There is a way to fail even faster – not at runtime, but at compile time. To achieve that, we need to encode the connection between a Character and its Franchise at the type level. You cannot simply assign an instance of the B that is bound to a2 to the field on a1 – the one is an a2.B, the other expects an a1.B. The dot syntax represents the path to the type, going along concrete instances of other types. Hence the name, path-dependent types. Now, the type Character is nested in the type Franchise, which means that it is dependent on a specific enclosing instance of the Franchise type. These two compile, as expected. They are tasteless, but what can we do? As you can see, the type of the lovestruck and objectOfDesire parameters depends on the Franchise instance passed to the method. Note that this only works if the instance on which other types depend is in its own parameter list. We have defined a class Key with an abstract type member Value. The methods on AwesomeDB refer to that type without ever knowing or caring about the specific manifestation of this abstract type. While path-dependent types are not necessarily omnipresent in your typical Scala code, they do have a lot of practical value beyond modelling the domain of fan fiction. One of the most widespread uses is probably seen in combination with the cake pattern, which is a technique for composing your components and managing their dependencies, relying solely on features of the language. See the excellent articles by Debasish Ghosh and Precog’s Daniel Spiewak to learn more about both the cake pattern and how it can be improved by incorporating path-dependent types. In general, whenever you want to make sure that objects created or managed by a specific instance of another type cannot accidentally or purposely be interchanged or mixed, path-dependent types are the way to go. Path-dependent types and dependent method types play a crucial role for attempts to encode information into types that is typically only known at runtime, for instance heterogenous lists, type-level representations of natural numbers and collections that carry their size in their type. Miles Sabin is exploring the limits of Scala’s type system in this respect in his excellent library Shapeless. After having discussed several functional programming techniques for keeping things DRY and flexible in the last two weeks, in particular function composition, partial function application, and currying, we are going to stick with the general notion of making your code as flexible as possible. However, this time, we are not looking so much at how you can leverage functions as first-class objects to achieve this goal. Instead, this article is all about using the type system in such a manner that it’s not in the way, but rather supports you in keeping your code extensible: You’re going to learn about type classes. You might think that this is some exotic idea without practical relevance, brought into the Scala community by some vocal Haskell fanatics. This is clearly not the case. Type classes have become an important part of the Scala standard library and even more so of many popular and commonly used third-party open-source libraries, so it’s generally a good idea to make yourself familiar with them. I will discuss the idea of type classes, why they are useful, how to benefit from them as a client, and how to implement your own type classes and put them to use for great good. Instead of starting off by giving an abstract explanation of what type classes are, let’s tackle this subject by means of an – admittedly simplified, but nevertheless resonably practical – example. Imagine that we want to write a fancy statistics library. This means we want to provide a bunch of functions that operate on collections of numbers, mostly to compute some aggregate values for them. Imagine further that we are restricted to accessing an element from such a collection by index and to using the reduce method defined on Scala collections. We impose this restriction on ourselves because we are going to re-implement a little bit of what the Scala standard library already provides – simply because it’s a nice example without many distractions, and it’s small enough for a blog post. Finally, our implementation assumes that the values we get are already sorted. The median cuts a data set in half, whereas the lower and upper quartile (first and third element of the tuple returned by our quartile method), split the lowest and highest 25 percent of the data, respectively. Our iqr method returns the interquartile range, which is the difference between the upper and lower quartile. Now, of course, we want to support more than just double numbers. So let’s implement all these methods again for Int numbers, right? Well, no! First of all, that would be a tiny little bit repetitious, wouldn’t it? Also, in situations such as these, we quickly run into situations where we cannot overload a method without some dirty tricks, because the type parameter suffers from type erasure. def median(xs: Vector[Number]): Number = ??? def quartiles(xs: Vector[Number]): (Number, Number, Number) = ??? def iqr(xs: Vector[Number]): Number = ??? def mean(xs: Vector[Number]): Number = ??? Thankfully, in this case there is no such common trait, so we aren’t tempted to walk this road at all. However, in other cases, that might very well be the case – and still be a bad idea. Not only do we drop previously available type information, we also close our API against future extensions to types whose sources we don’t control: We cannot make some new number type coming from a third party extend the Number trait. Now we have solved the problem of extensibility: Users of our library can pass in a NumberLike adapter for Int (which we would likely provide ourselves) or for any possible type that might behave like a number, without having to recompile the module in which our statistics methods are implemented. However, always wrapping your numbers in an adapter is not only tiresome to write and read, it also means that you have to create a lot of instances of your adapter classes when interacting with our library. A powerful alternative to the approaches outlined so far is, of course, to define and use a type class. Type classes, one of the prominent features of the Haskell language, despite their name, haven’t got anything to do with classes in object-oriented programming. A type class C defines some behaviour in the form of operations that must be supported by a type T for it to be a member of type class C. Whether the type T is a member of the type class C is not inherent in the type. Rather, any developer can declare that a type is a member of a type class simply by providing implementations of the operations the type must support. Now, once T is made a member of the type class C, functions that have constrained one or more of their parameters to be members of C can be called with arguments of type T.
As such, type classes allow ad-hoc and retroactive polymorphism. Code that relies on type classes is open to extension without the need to create adapter objects. In Scala, type classes can be implemented and used by a combination of techniques. It’s a little more involved than in Haskell, but also gives developers more control. We have created a type class called NumberLike. Type classes always take one or more type parameters, and they are usually designed to be stateless, i.e. the methods defined on our NumberLike trait operate only on the passed in arguments. In particular, where our adapter above operated on its member of type T and one argument, the methods defined for our NumberLike type class take two parameters of type T each – the member has become the first parameter of the operations supported by NumberLike. Two things: First, you see that the two implementations are basically identical. That is not always the case when creating members of a type classes. Our NumberLike type class is just a rather narrow domain. Later in the article, I will give examples of type classes where there is a lot less room for duplication when implementing them for multiple types. Second, please ignore the fact that we are losing precision in NumberLikeInt by doing integer division. It’s all to keep things simple for this example. As you can see, members of type classes are usually singleton objects. Also, please note the implicit keyword before each of the type class implementations. This is one of the crucial elements for making type classes possible in Scala, making type class members implicitly available under certain conditions. More about that in the next section. This may look a little intimidating at first, but it’s actually quite simple. Our method takes a type parameter T and a single parameter of type Vector[T]. The idea to constrain a parameter to types that are members of a specific type class is realized by means of the implicit second parameter list. What does this mean? Basically, that a value of type NumberLike[T] must be implicitly available in the current scope. This is the case if an implicit value has been declared and made available in the current scope, very often by importing the package or object in which that implicit value is defined. If and only if no other implicit value can be found, the compiler will look in the companion object of the type of the implicit parameter. Hence, as a library designer, putting your default type class implementations in the companion object of your type class trait means that users of your library can easily override these implementations with their own ones, which is exactly what you want. Users can also pass in an explicit value for an implicit parameter to override the implicit values that are in scope. A context bound T : NumberLike means that an implicit value of type NumberLike[T] must be available, and so is really equivalent to having a second implicit parameter list with a NumberLike[T] in it. If you want to access that implicitly available value, however, you need to call the implicitly method, as we do in the iqr method. If your type class requires more than one type parameter, you cannot use the context bound syntax. libraryDependencies += "joda-time" % "joda-time" % "2.1"
libraryDependencies += "org.joda" % "joda-convert" % "1.3"
Our NumberLike type class was a nice exercise, but Scala already ships with the Numeric type class, which allows you to call methods like sum or product on collections for whose type T a Numeric[T] is available. Another type class in the standard library that you will use a lot is Ordering, which allows you to provide an implicit ordering for your own types, available to the sort method on Scala’s collections. There are more type classes in the standard library, but not all of them are ones you have to deal with on a regular basis as a Scala developer. A very common use case in third-party libraries is that of object serialization and deserialization, most notably to and from JSON. By making your classes members of an appropriate formatter type class, you can customize the way your classes are serialized to JSON, XML or whatever format is currently the new black. Mapping between Scala types and ones supported by your database driver is also commonly made customizable and extensible via type classes. Once you start to do some serious work with Scala, you will inevitably stumble upon type classes. I hope that after reading this article, you are prepared to take advantage of this powerful technique. Scala type classes allow you to develop your Scala code in such a way that it’s open for retroactive extension while retaining as much concrete type information as possible. In contrast to approaches from other languages, they give developers full control, as default type class implementations can be overridden without much hassle, and type classes implementations are not made available in the global namespace. You will see that this technique is especially useful when writing libraries intended to be used by others, but type classes also have their use in application code to decrease coupling between modules. I’m Daniel Westheide, a software developer from Berlin, Germany. I am working as a senior consultant at INNOQ. On this blog, I’m discussing functional programming, usability, as well as anything related to the software development process. You can get in touch via email. 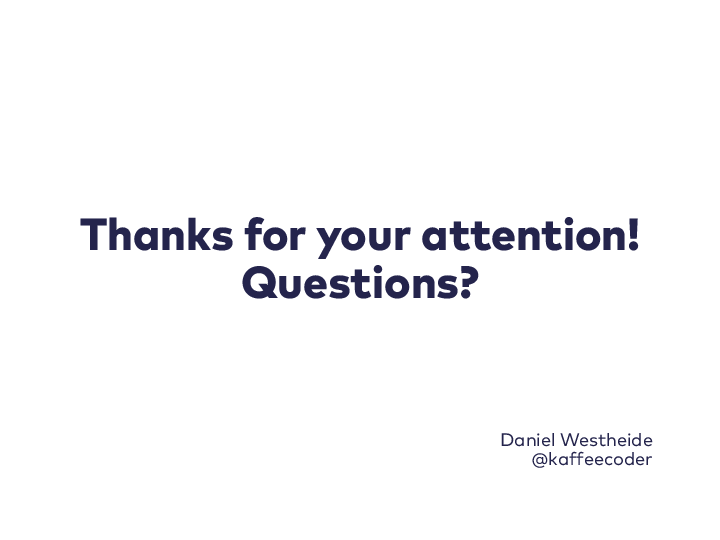 I can also be found on Twitter as @kaffeecoder. More content published by me can be found on the INNOQ website. 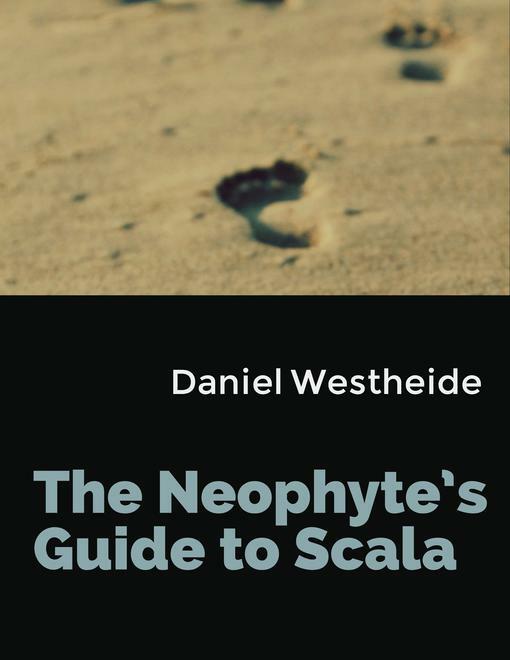 Get The Neophyte’s Guide to Scala e-book at LeanPub.